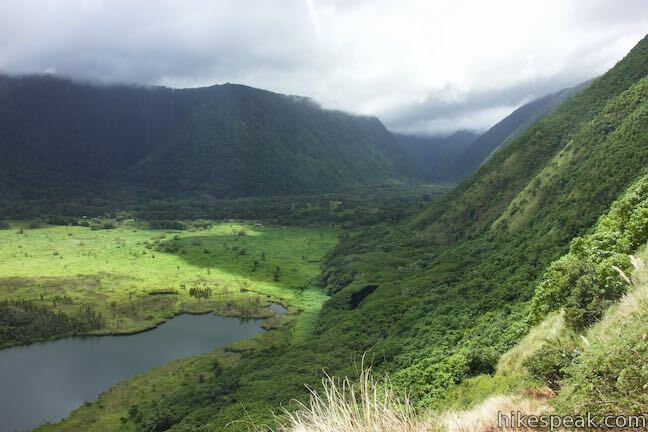 Waipi‘o Valley is known as the Valley of Kings for its regal chapter in Hawaiian history. 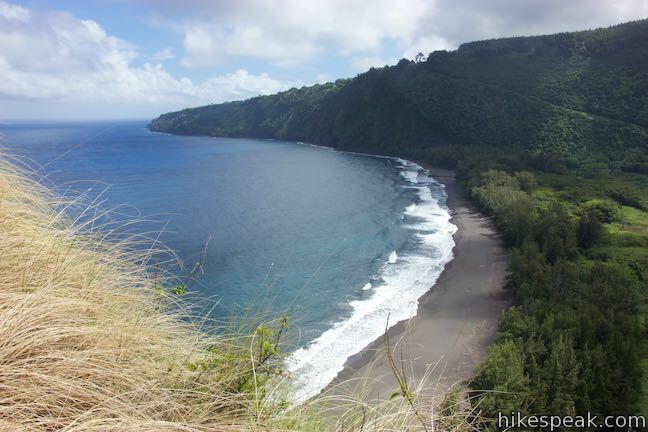 You’re bound to feel high and mighty while looking across this remote valley and its pristine beach from a panoramic perch on Muliwai Trail. 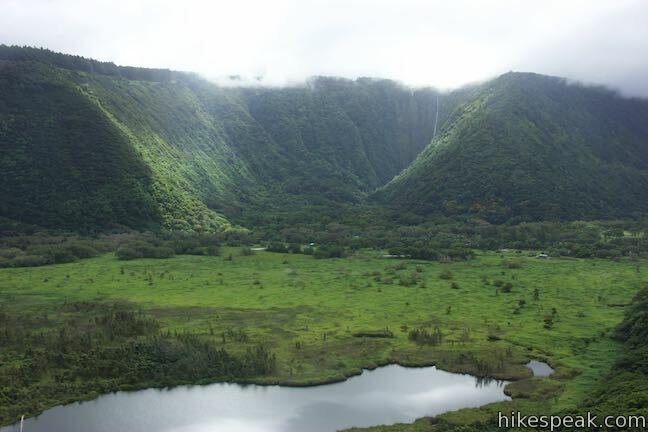 Waipi‘o Valley has steep, thousand foot-tall cliffs, so entering the valley is no simple stroll. 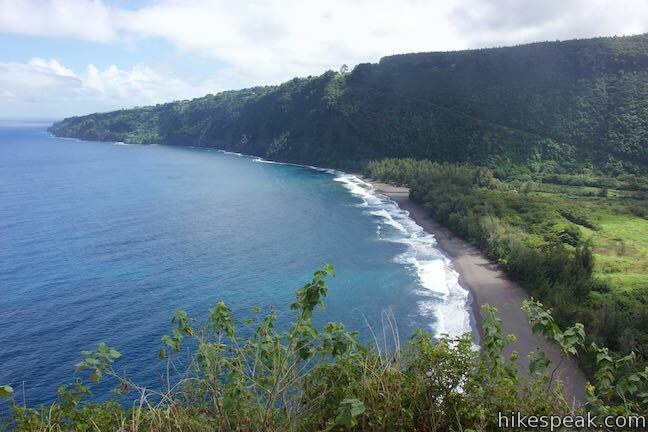 Cross Waipi‘o Beach and visit Muliwai Trail Overlook on a 4.88-mile round trip hike that has climbs on each side of the valley that total 1,300 feet of elevation gain. 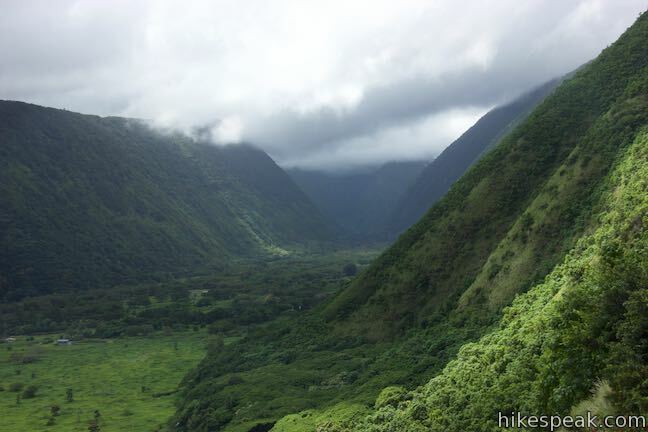 Waipi‘o Valley is a special place for an extra Hawaiian hike. 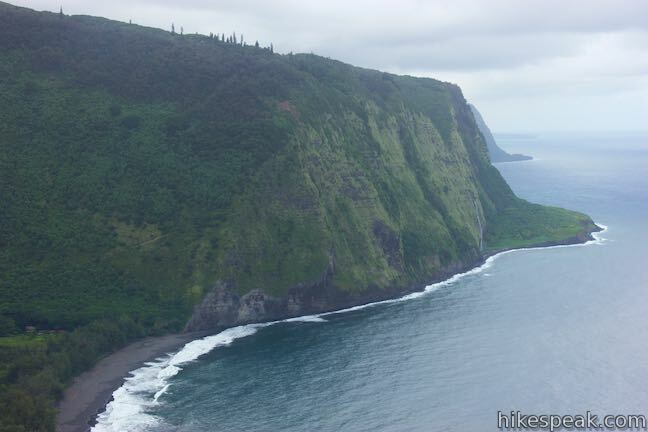 Waipi‘o is a deep valley on the Hāmākua Coast on the north side of the Big Island of Hawai‘i. 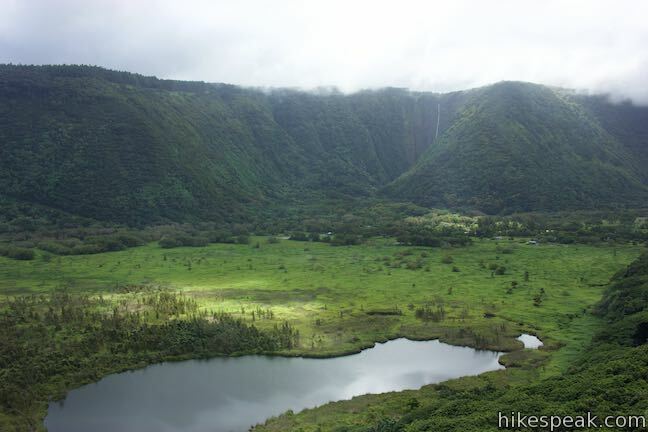 Muliwai Trail starts on the west side of Waipi‘o Valley and travels 7.7 miles to Waimanu Valley, crossing several smaller valleys en route. 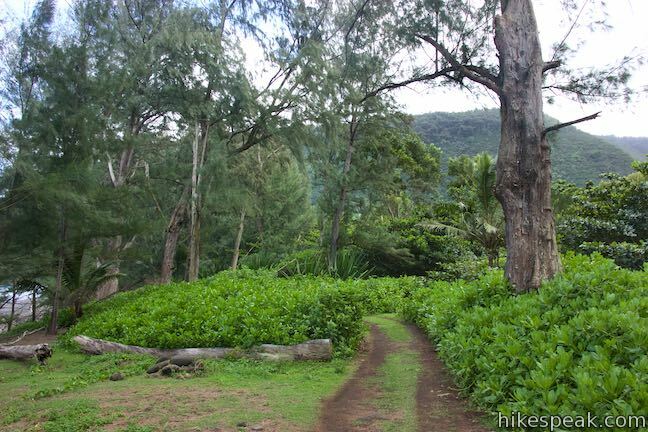 Muliwai Trail is too long and arduous for a day hike, but you only need to hike 1/3 of a mile up the trail to Muliwai Trail Overlook for a worthwhile outing. 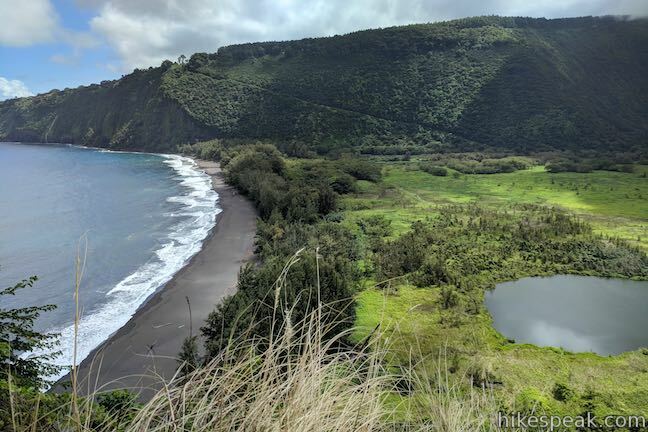 To get started, make your way to the very end of Honokaa-Waipio Road where Waipio Lookout (also known as Waipi‘o Valley Lookout) has a small parking area off the right side of the road. 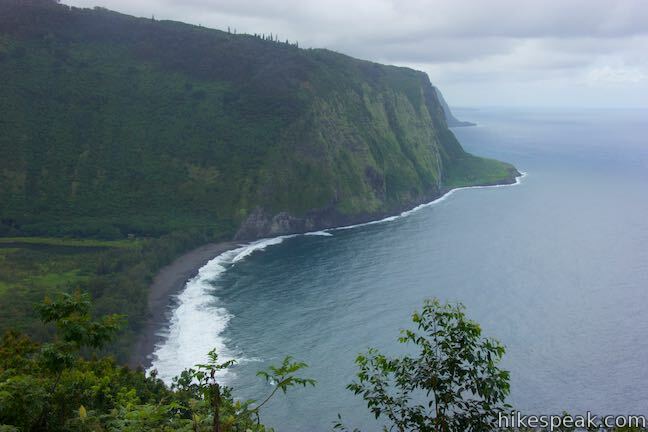 Straight off the end of Honokaa-Waipio Road, Waipio Valley Road begins a determined descent from the rim of the valley down to its floor. 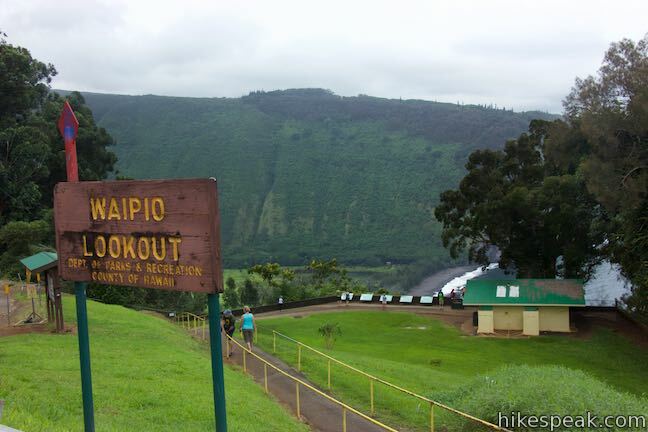 Before getting underway, the first thing to do is to check out Waipio Lookout. 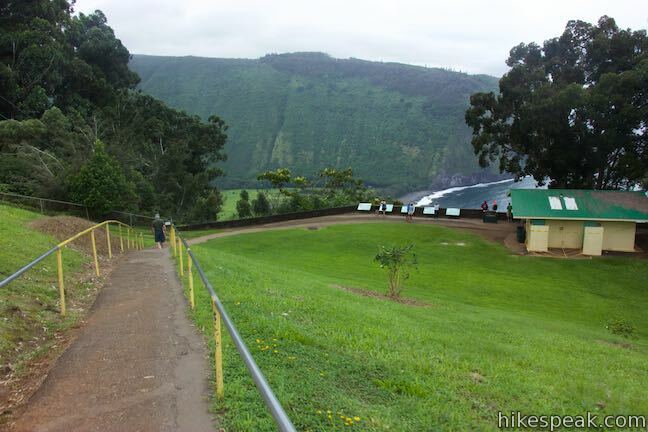 A paved path from the parking area descends to a collection of info panels accompanying views across Waipi‘o Valley and Waipi‘o Beach. Gaze west across the valley toward rugged cliffs dropping into the Pacific Ocean. 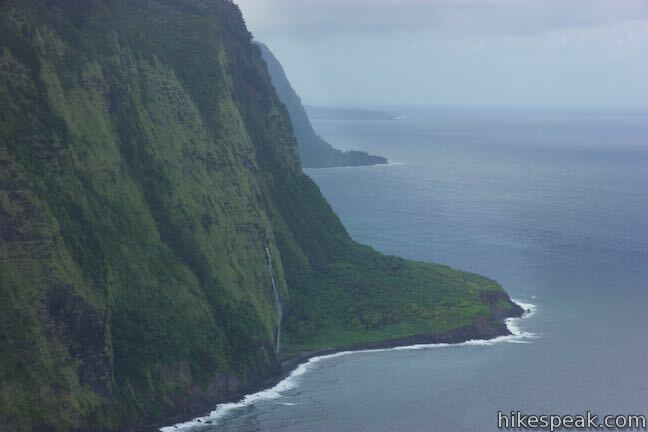 Look closely at the imposing, verdant cliffs on the far side of the valley to spot Muliwai Trail zigzagging up the side. 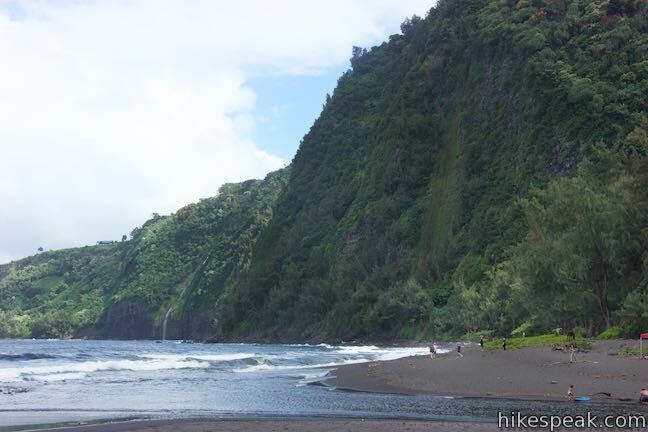 To the right of the trail, around the end of the ridge, you may spot ephemeral Waipahoehoe Falls streaking down the cliffs to the shoreline. 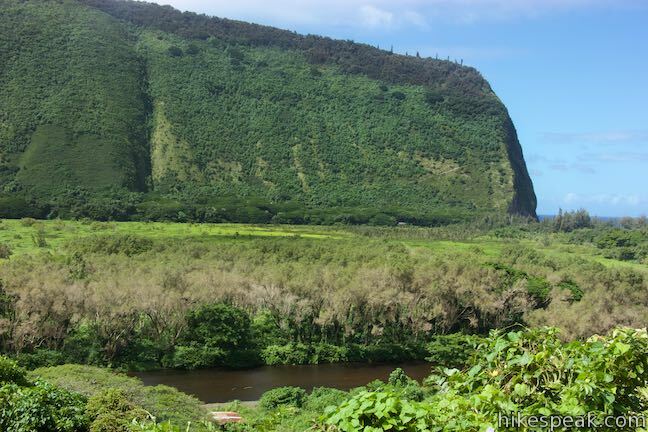 The info panels explain that Waipi‘o Valley was the chosen home of many Hawaiian kings. 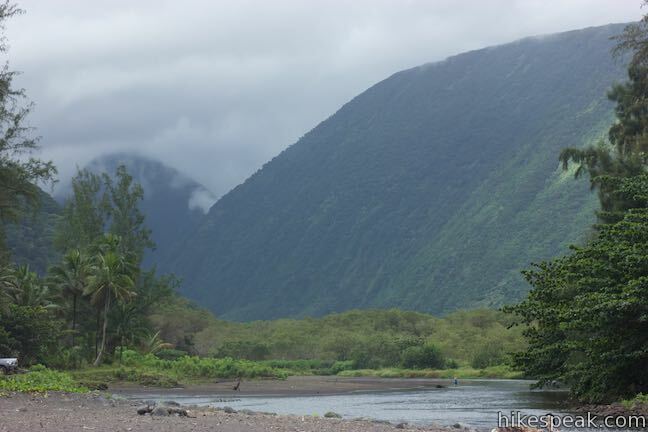 Nine rules in the Pili dynasty lived in Waipi‘o Valley, including Umi-a-Līloa, who united the Big Island under one ruler. 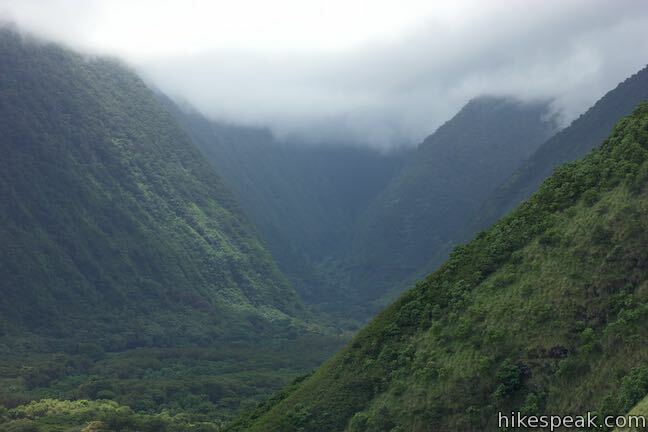 Waipi‘o Valley was also the mythological home of Hawaiian gods like Kanaloa and Kāne. 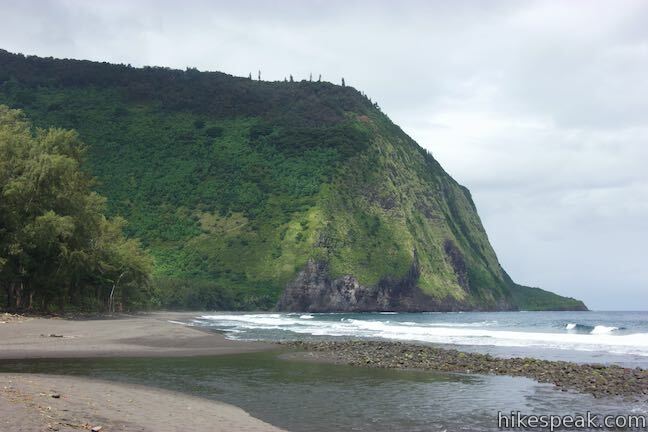 In 1946, tidal waves changed Waipi‘o forever – picture 55-foot tall waves sweeping up the valley – destroying temples, both ancient and modern homes, and taro fields. Taro is the most important Hawaiian crop. 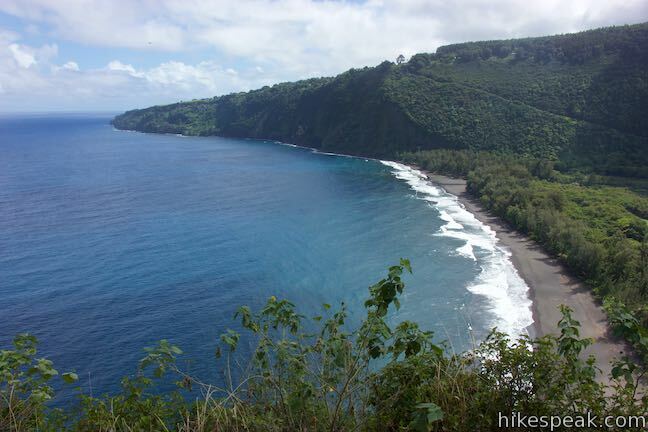 Leave Waipio Lookout and take the path to the south, which bridges a short distance to Waipio Valley Road. 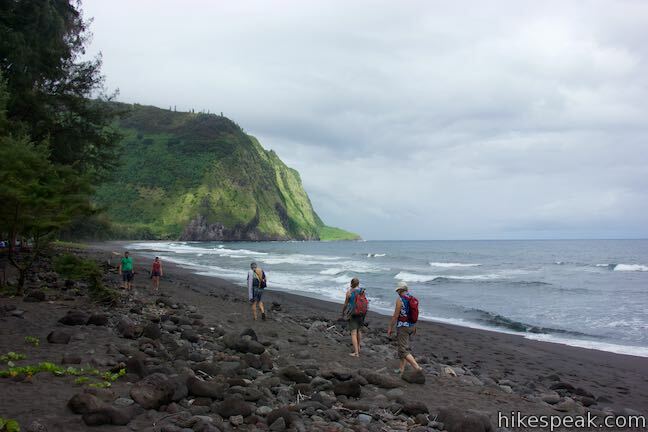 Reach the pavement and turn right down the Waipio Valley Road. 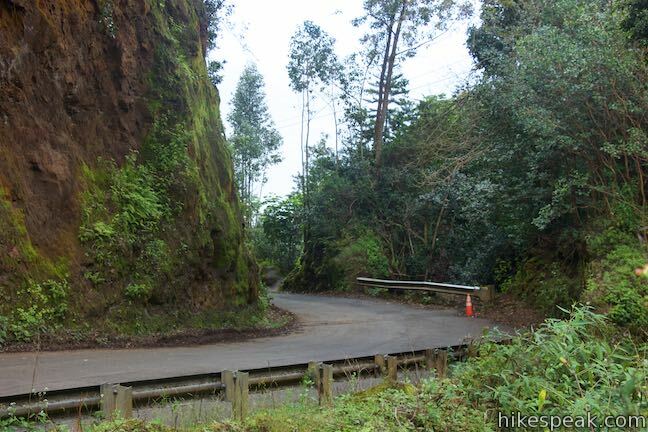 Waipio Valley Road is poorly paved, narrow, and extremely steep. 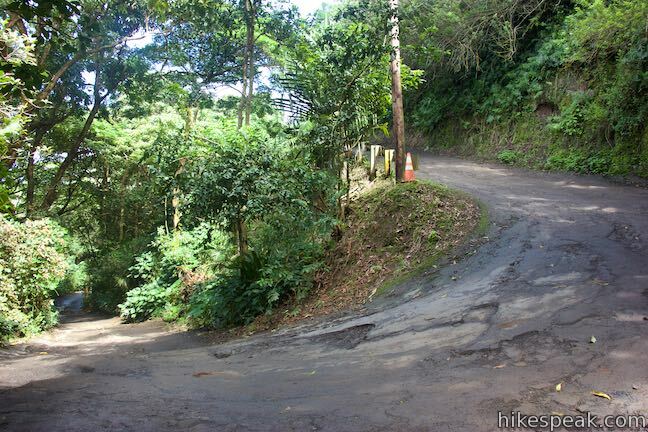 The road drops 850 feet in 0.83 miles and is restricted to high-clearance 4-wheel drive vehicles. The road’s average grade is 25% and some stretches pitch down to a 40% grade. 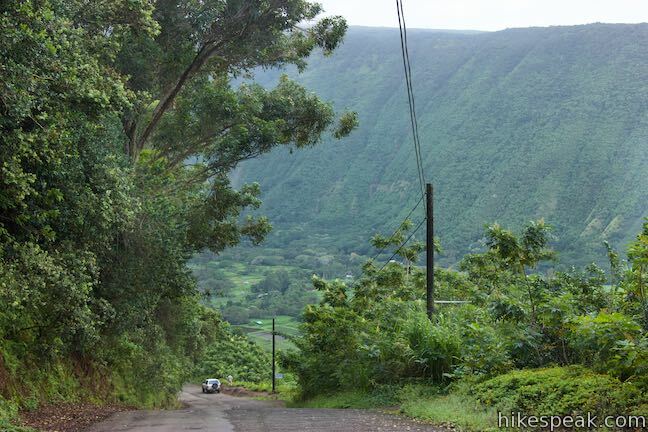 Driving into Waipi‘o Valley is not recommended for those who aren’t familiar with the road or don’t have appropriate vehicles. 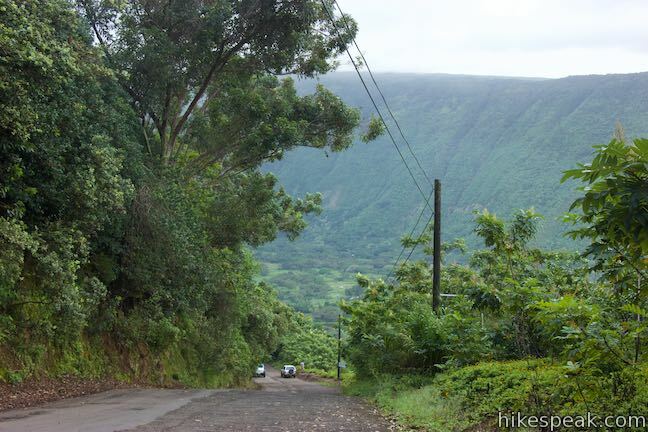 Many rental car agreements prohibit traveling down Waipi‘o Valley Road. 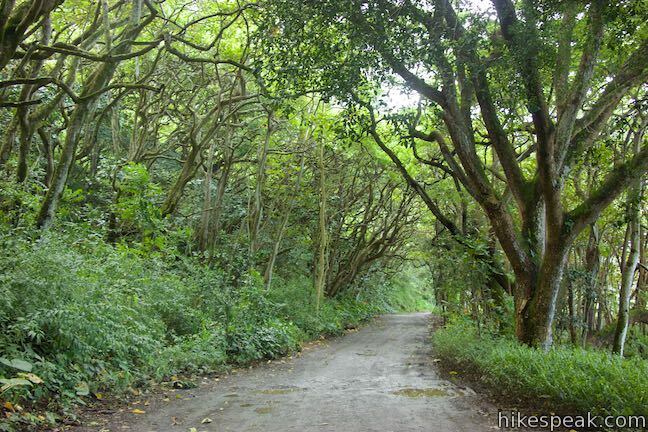 As the road is only meant to serve valley residents and guest, hikers should plan to set out from the top of Waipi‘o Valley Road and hike down. 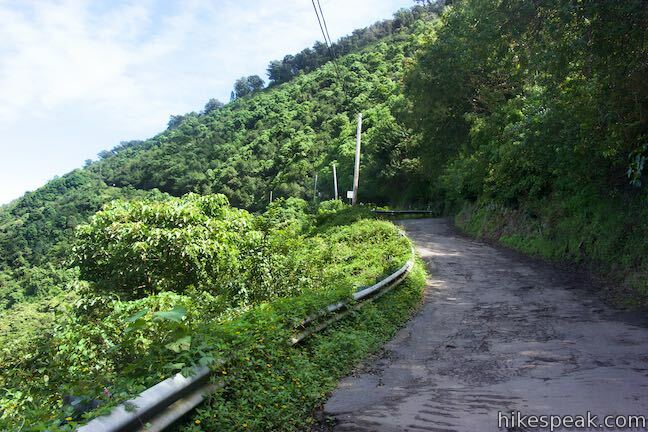 Waipio Valley Road is quite a roadway. 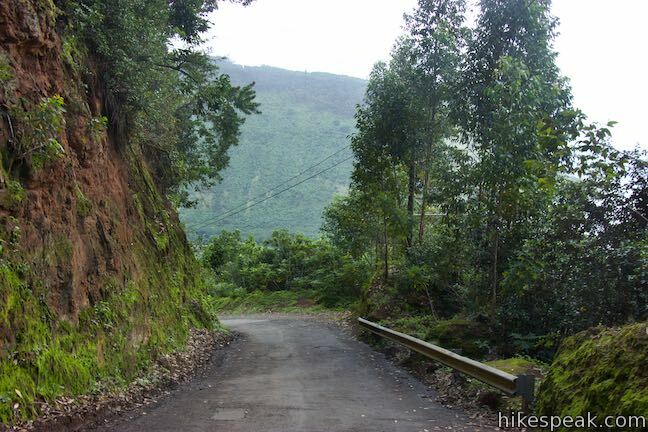 Cars have the right-of-way, so hikers need to stick to the side of the road away from vehicles. Descend swiftly to a horseshoe bend to the right. A fork of the road parts to the left from the outside of the bend. 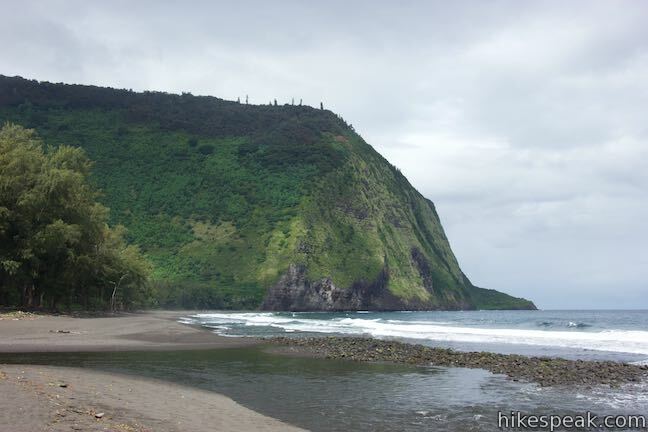 Stay to the right to continue down Waipio Valley Road. 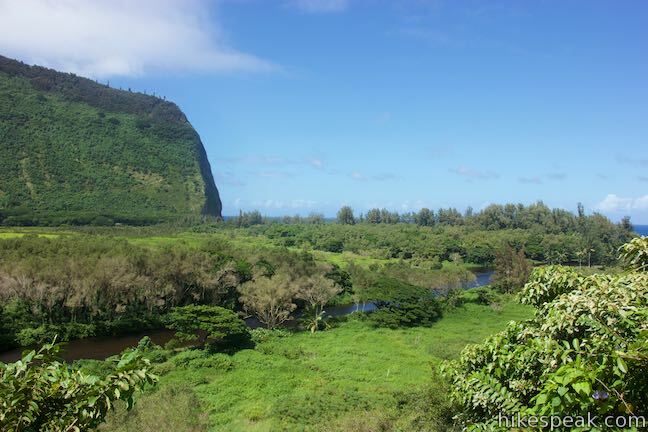 Coming out of the bend, the views start to open up across Waipi‘o Valley. Continue down the no no-nonsense road, angling down the side of the valley. The unrelenting road uncovers nice valley views. 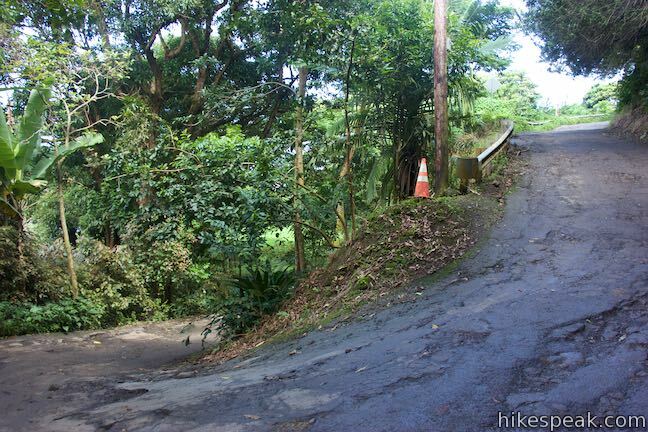 Keep in mind that you will have to hike back up this road at the end of the day, so be sure to save some energy, water, and snacks. Don’t overcommit yourself. 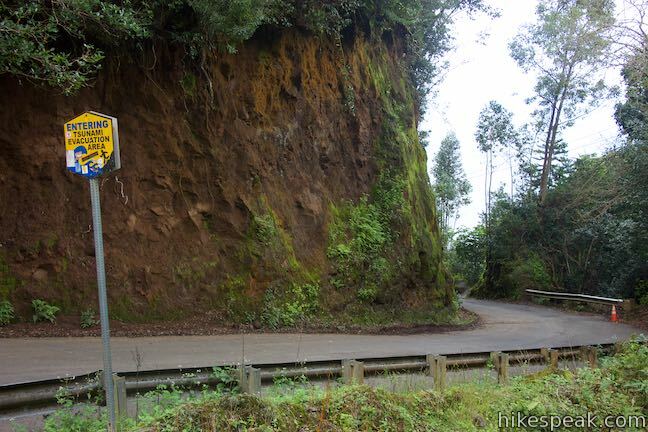 Waipio Valley Road is one extremely steep road! 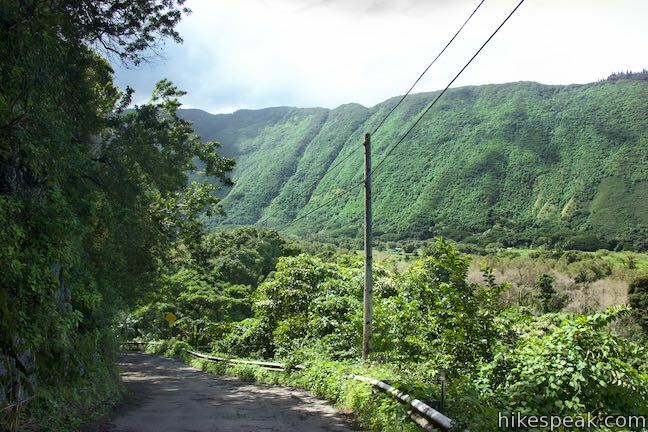 Keep traveling down into Waipi‘o Valley. 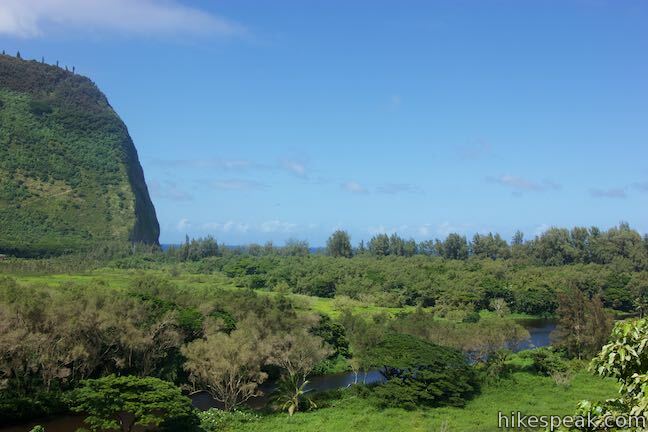 As you descend, Wailoa Stream grows more prominent, traveling across the valley floor toward the beach. During rainy months, a half dozen ephemeral waterfalls stream down creases on the west side of the valley. 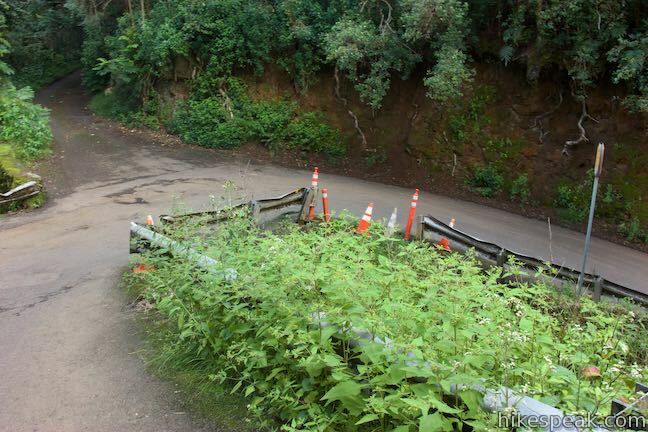 After 0.9 miles of hiking (including the initial exploration off Waipio Valley Road to Waipio Lookout), come to the bottom of the valley wall where the road hits an intersection. 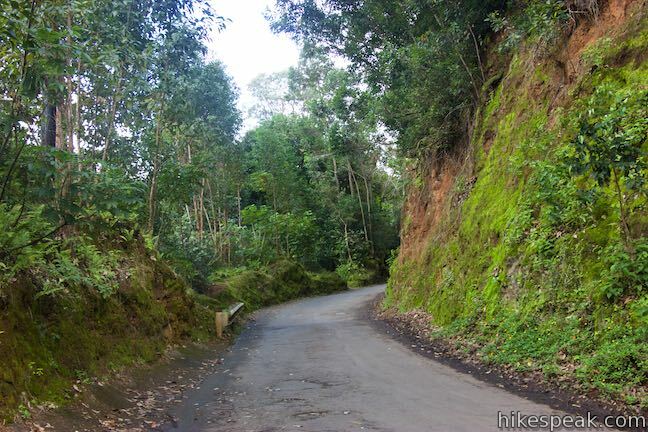 To the left, a road heads into more private areas up Waipi‘o Valley. 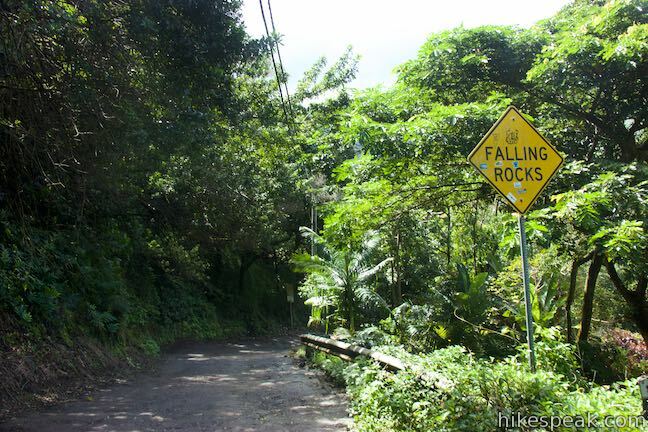 Resist the urge to get closer to Hi‘ilawe Falls and treat this road as through it is off limits. Turn right to head toward the coast. It should please you to discover that the road ahead is nice and level. 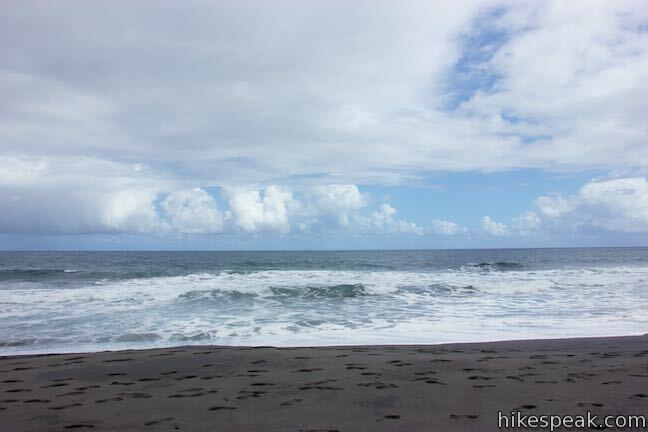 Indeed, there is little elevation change over the next 1.25 miles on the road and beach. 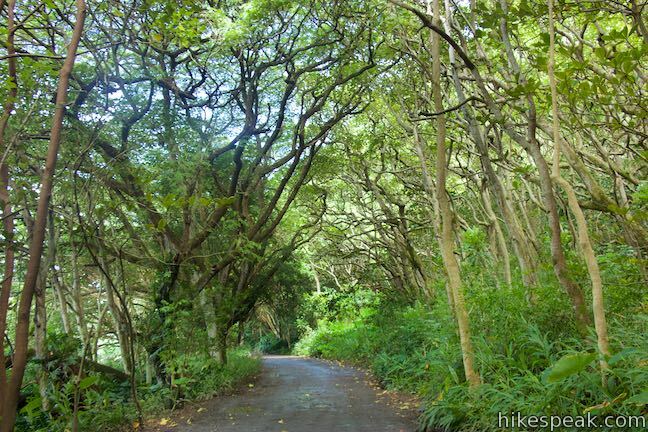 Make your way up the road past wetlands along Wailoa Stream. The trail passes through forest at the base of the valley wall. 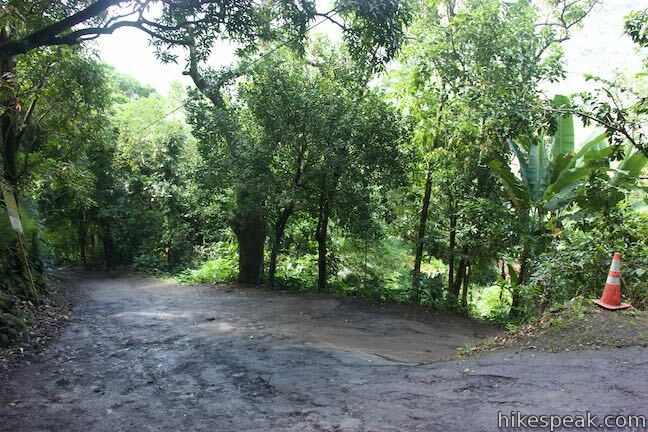 Although level, the dirt road has many mud puddles for you to dance around (or through). 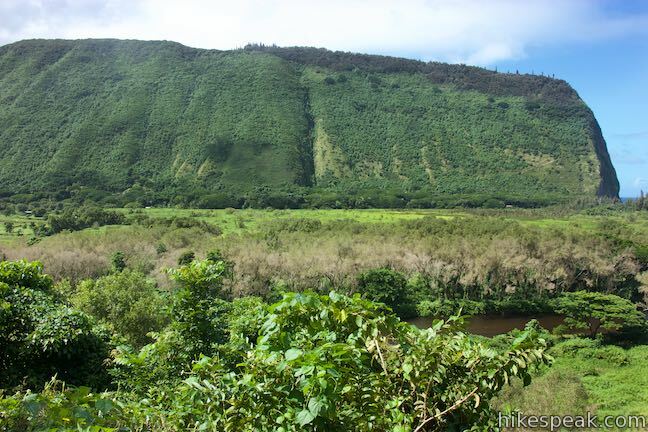 Feral horses live throughout Waipi‘o Valley. 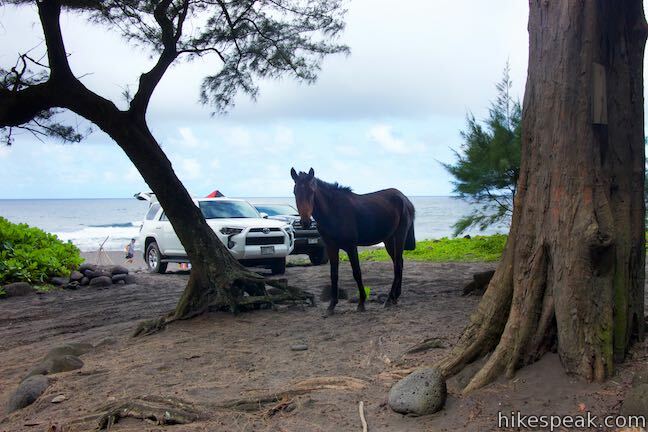 You are likely to cross a few horses along the road or at the beach. The horses seem to either ignore humans or act friendly in search of food. A tenth of a mile before the end of the road, stay to the right past another drive that branches off to the left. The more-traveled road is obvious. 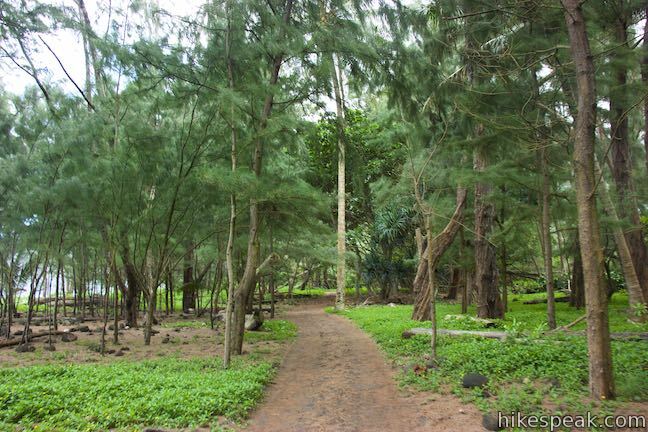 Soon after that, come to the edge of the forest behind Waipi‘o Beach. 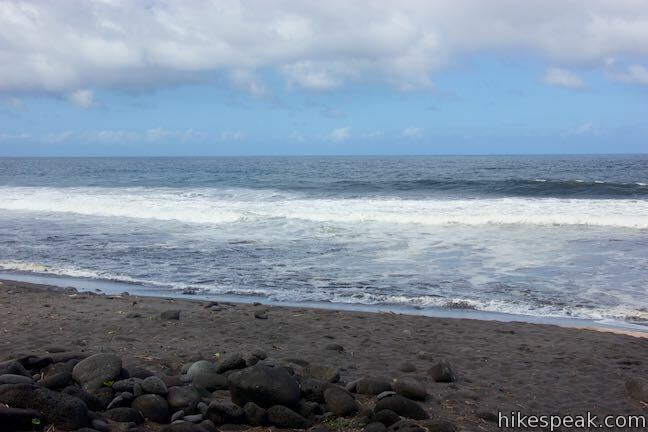 The road basically ends here (1.4 miles from the start of your adventure), but jeep trails extend to the right and left toward parking spaces behind the beach. 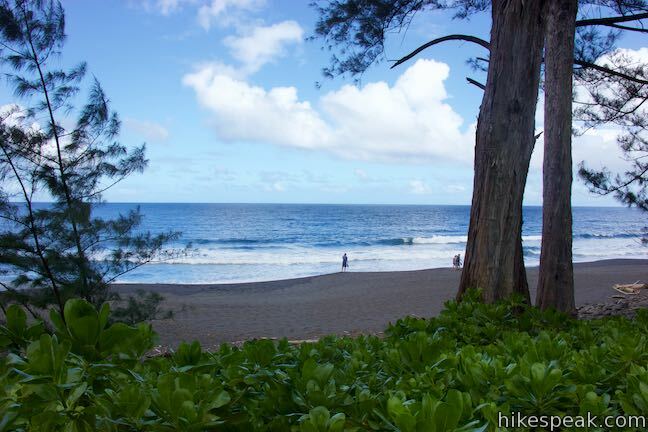 Waipi‘o Beach is a north-facing beach that is nearly a mile long. The road ends by the east side of the beach. 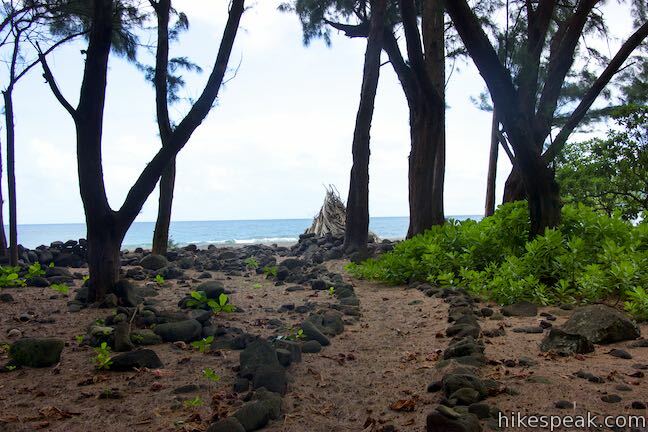 Muliwai Trail starts from the west end of Waipi‘o Beach, so fortunately for you, the next leg of the trek is to walk 3/4 of a mile across the beach. 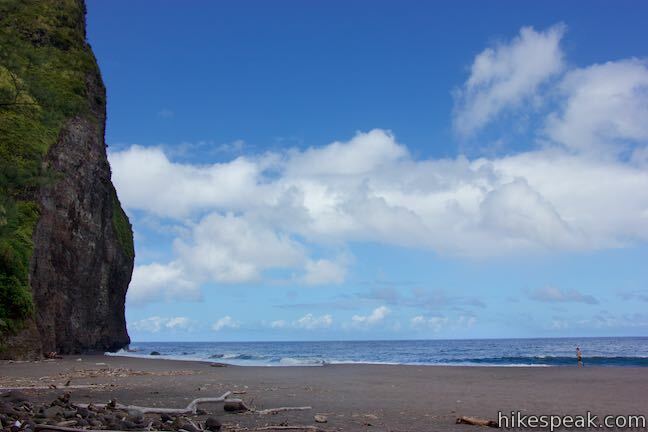 If you turned right at the end of the road, instead of heading west, you’d find that the beach continues for another 0.2 miles, becoming very rocky as it meets cliffs at the east edge of the beach. 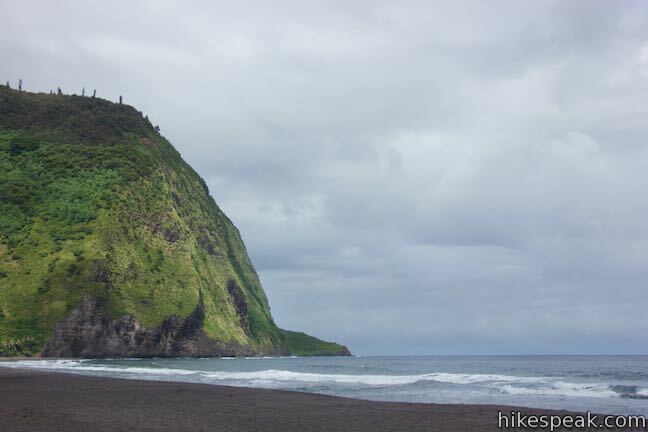 For another Waipi‘o adventure, visitors can trek half a mile along the rocky coastline to the spot where Lakuahine Falls tumbles down the cliffs to the ocean. 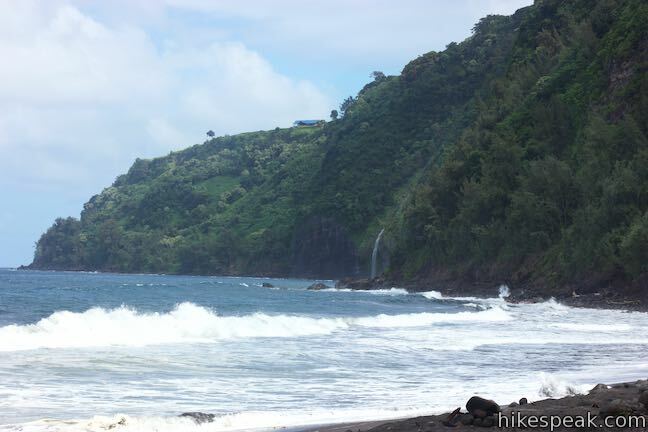 During high tide or rough surf, do not attempt to cross the boulders along the way to Lakuahine Falls as it can be too dangerous. 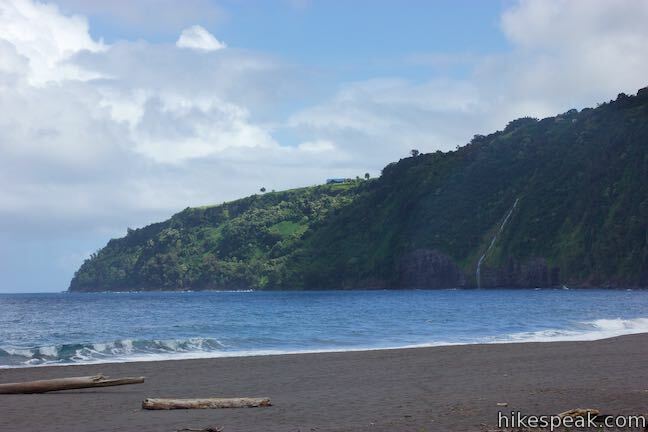 To get a perspective of Lakuahine Falls, it is actually easier to head west along the beach, away from the waterfall, allowing it to peak out from behind the cliffs and come into view. Bear left at the end of the road and walk either across the beach or on paths through the trees just behind the sand. 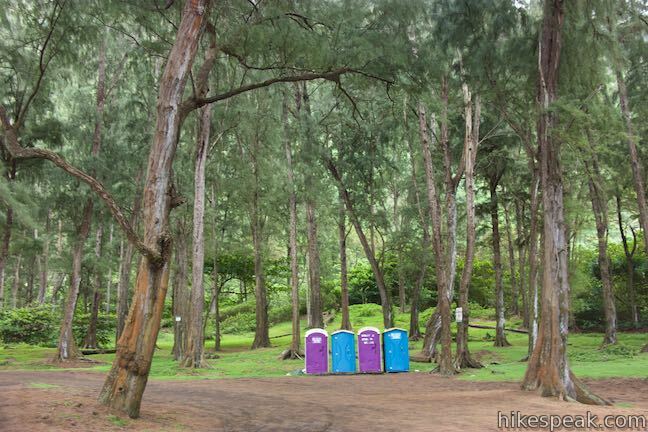 Portable toilets (of unreliable cleanliness) are located in the forest near the end of the road. 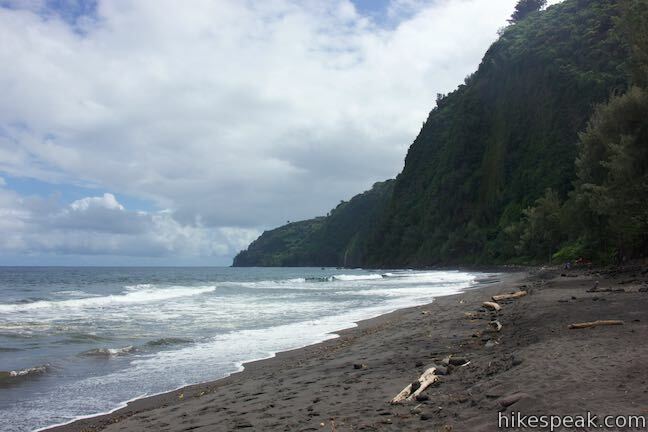 Waipi‘o Beach is quite a place, with almost a mile of welcoming black sand stretched out between towering cliffs. The coastline is undeveloped and gorgeous. The ocean may not be an inviting place to swim, however. Particularly when the surf is rough, the rip current can be quite dangerous. Do not swim or surf without experience in these conditions. 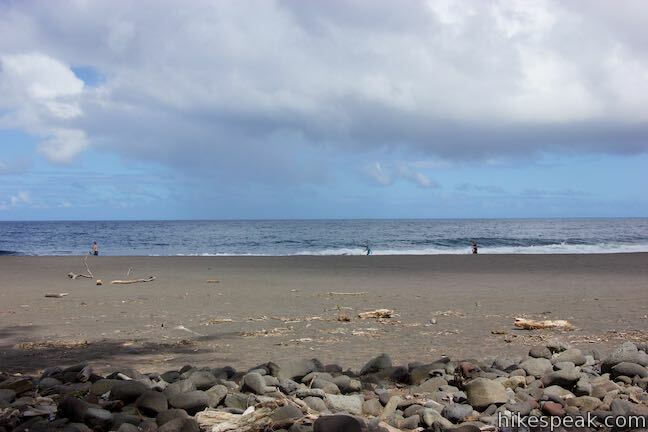 Walk west along Waipi‘o Beach for 300 yards to an interruption in the sand. 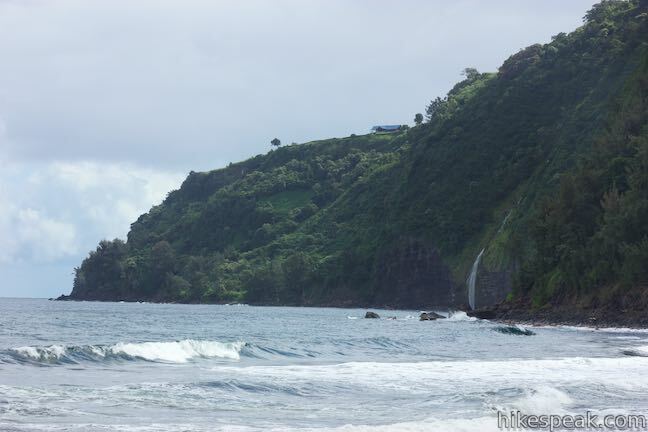 Wailoa Stream flows across the beach and into the ocean. No bridge crosses the stream, so you will need to wade across to reach the rest of the beach. 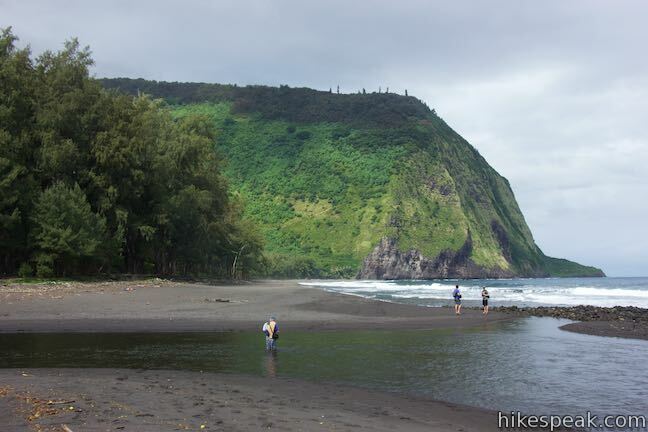 Depending on the levels of the stream and the tide (and also your height), you’ll need to wade in up to your thigh or your waist to cross Wailoa Stream. 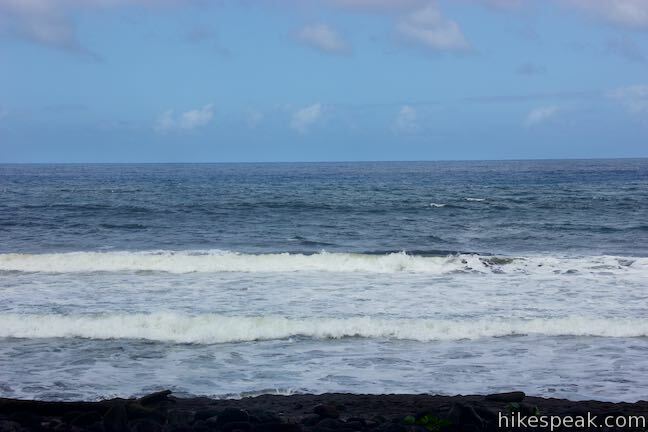 The crossing can be difficult after major rainstorms and during high surf, so proceed only when safe. 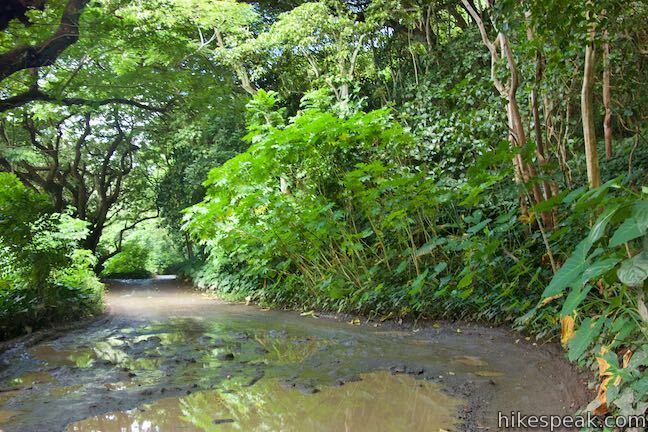 Wear water shoes to cross Wailoa Stream, or just go barefoot or in flip-flops. 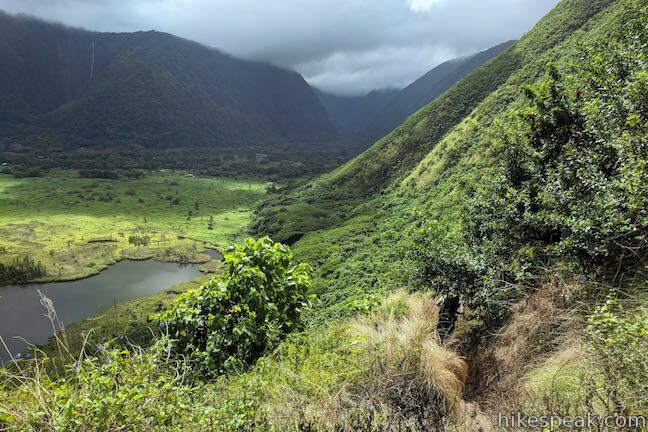 The water in Waipi‘o Valley is known to contain leptospirosis, a sickening bacteria, so do not drink any of the water or make contact with the stream with open cuts. 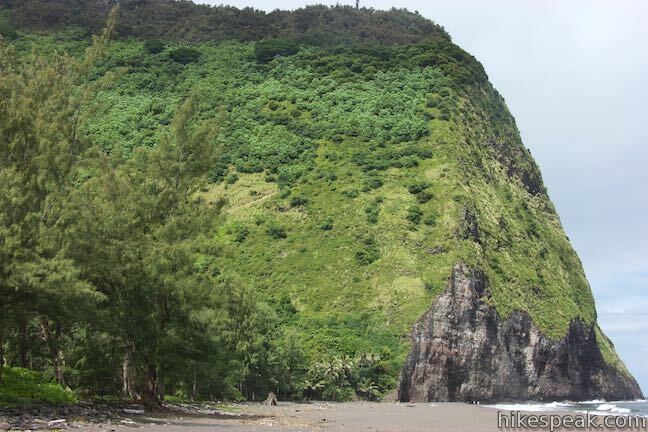 While you might share the east side of Waipi‘o Beach with a few parties of people, the rest of the beach should feel more secluded. 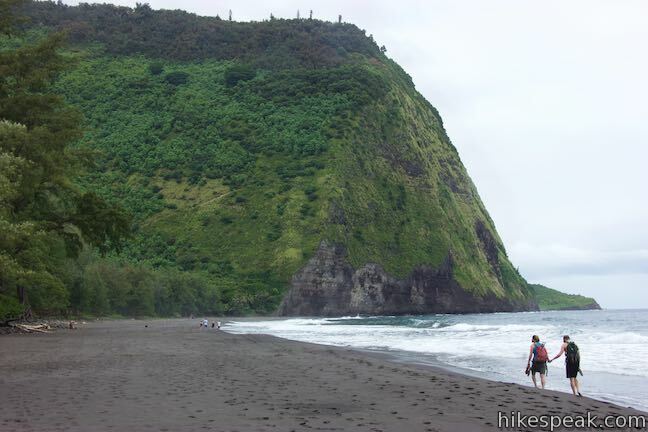 The creek crossing provides enough of a barrier that you could have the rest of Waipi‘o Beach mostly to yourself. 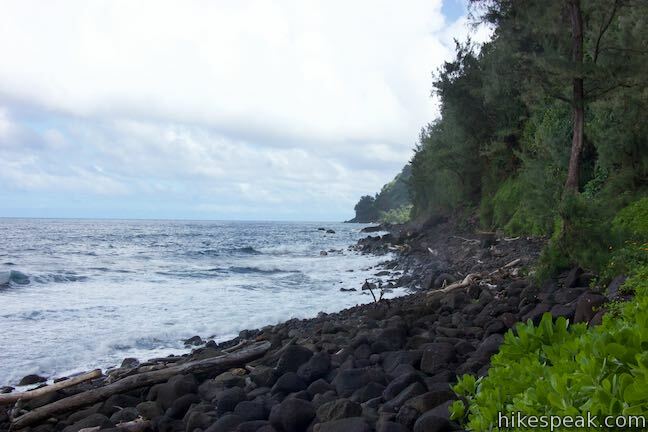 Route 1) If beaches aren’t really your thing, or if you prefer hiking on firmer ground (because you’re wearing a heavy pack, for example), find a path entering the woods on the left. 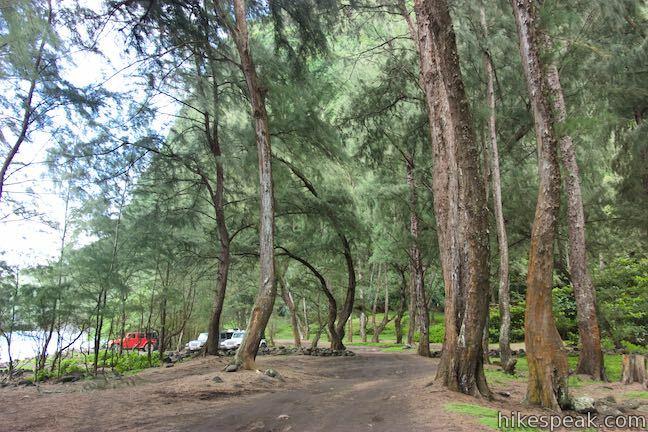 Connect to a jeep trail that heads west through ironwoods, firs, and fern trees in the forest just behind the beach. 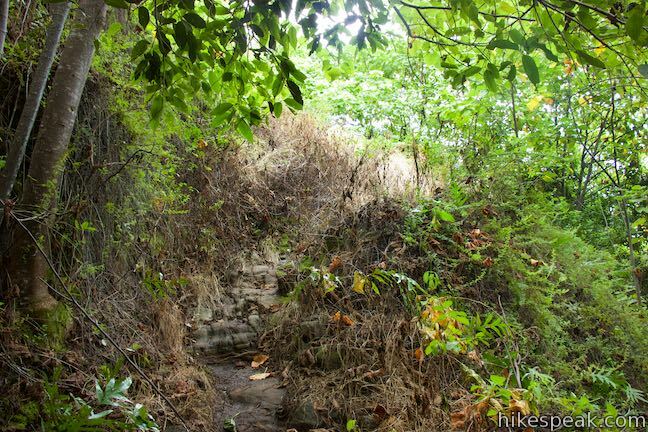 The trail has gently rolling terrain and passes through lots of vegetation. 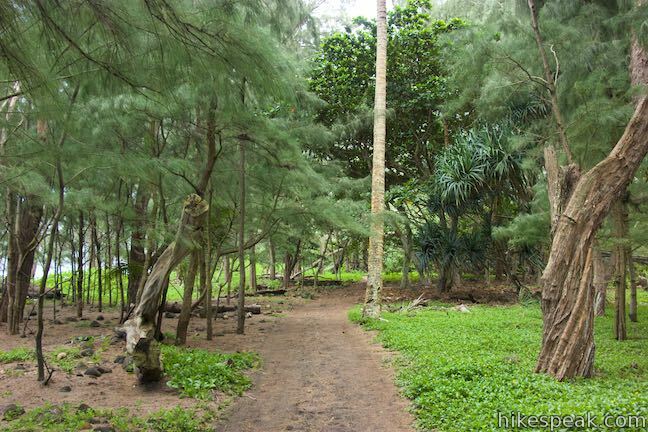 The partially shaded trail runs parallel to the beach. 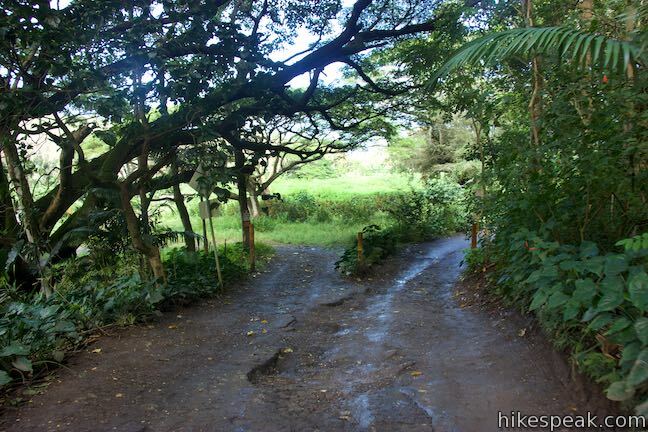 When the beach ends, the trail turns inland (left) along the side of the valley around Muliwai Pond, coming to a marked junction at the bottom of Muliwai Trail. 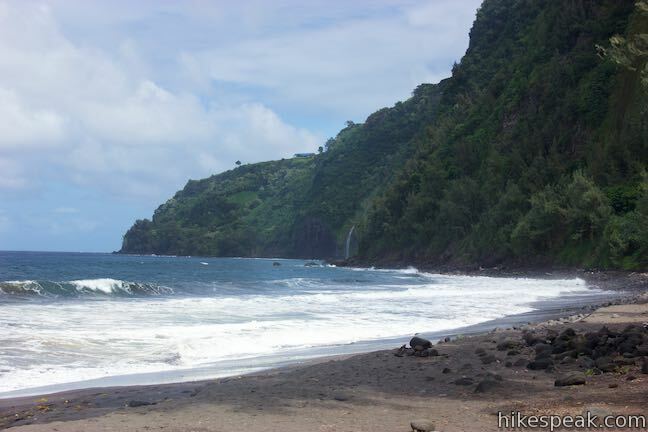 Route 2) The more obvious and more enjoyable route is to simply walk up the beach until you can’t go any farther. 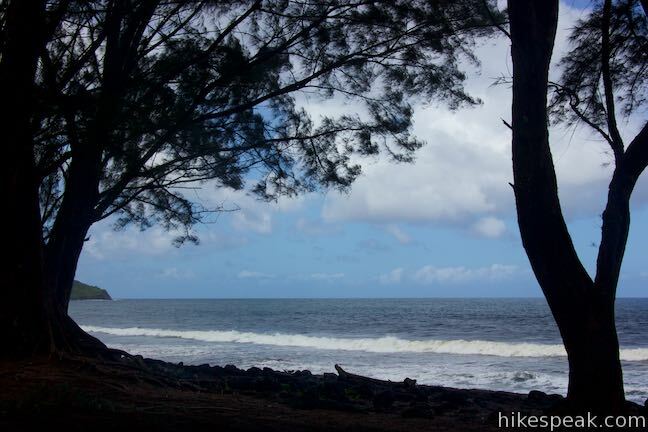 Waipi‘o Beach is fun to explore. 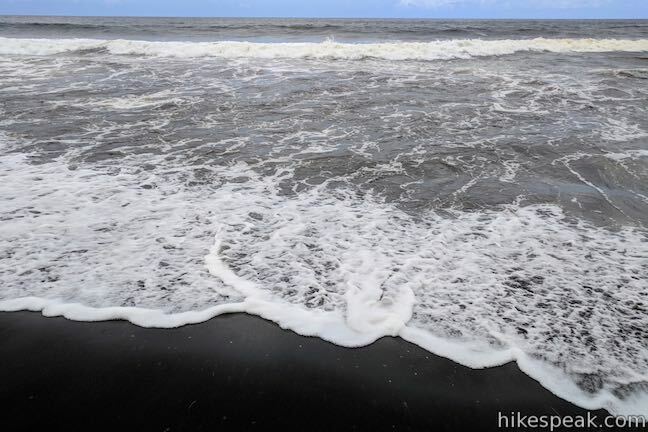 Sink your toes into the black sand. Look out across the ocean, which fills the horizon. 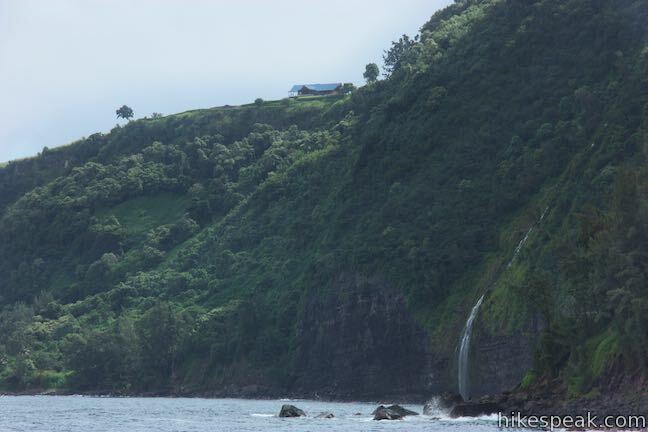 Over your shoulder, Lakuahine Falls pours down the cliffs on the east side of Waipi‘o Bay. 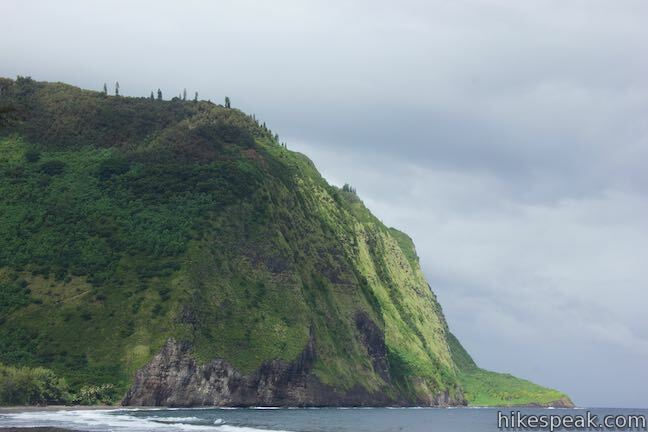 Straight ahead, the tall cliffs at the end of the beach look imposing, but are not inaccessible – because of the faint line of Muliwai Trail that zigzags up the valley wall. 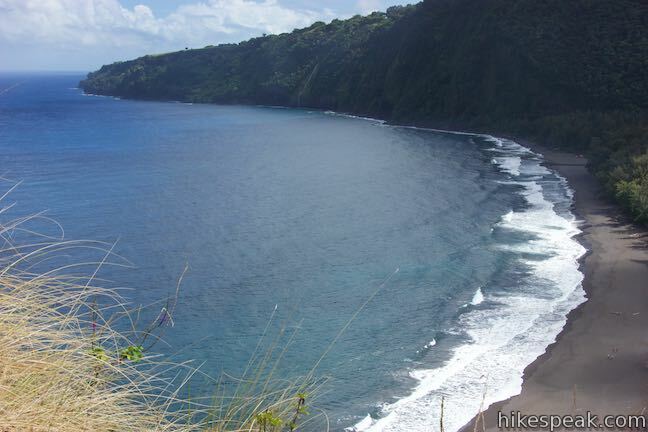 You may notice hikers standing at the end of a switchback straight above the beach. That is the overlook destination for this hike. Out around the west side of the cliffs, the coastline has a magical untouched quality. 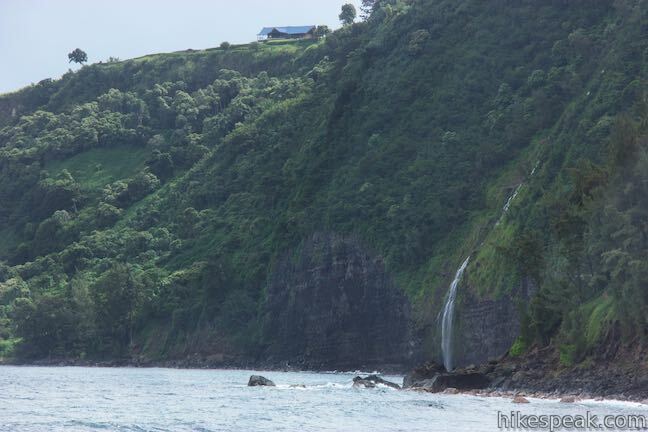 When the water is flowing, the white ribbon of Waipahoehoe Falls courses off the cliffs toward the coast. Large driftwood tree trunks are strewn across the back of the beach. Some act as nice benches, should you wish to take a break. 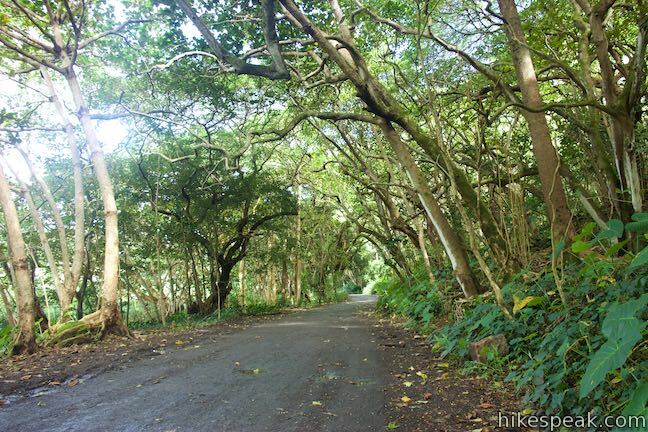 In the fall, ripe guavas fall from the trees in Waipi‘o Valley and get carried to the ocean by Wailoa Stream. The fruit washes up on the beach like little yellow balls of driftwood. Instead of walking straight into the cliffs at the west end of the beach, bear left and head toward the trees. 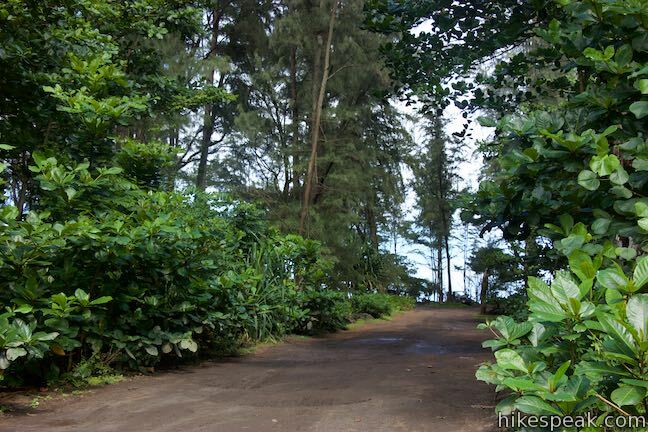 Meet the trail that runs behind the beach and follow the trail into the forest toward some cabins. 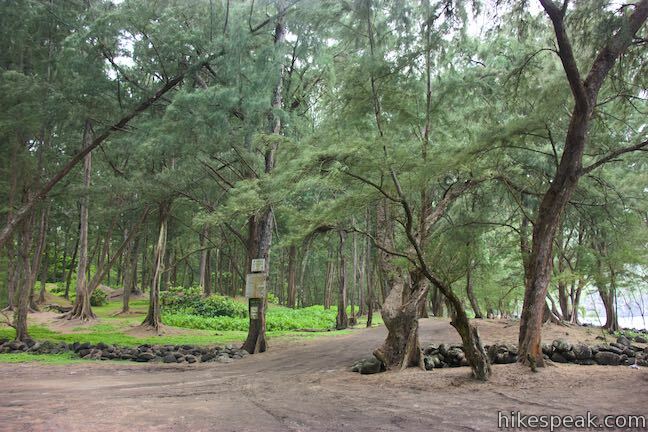 Before the beach is even out of sight, you’ll come to a marked junction at the bottom of Muliwai Trail. 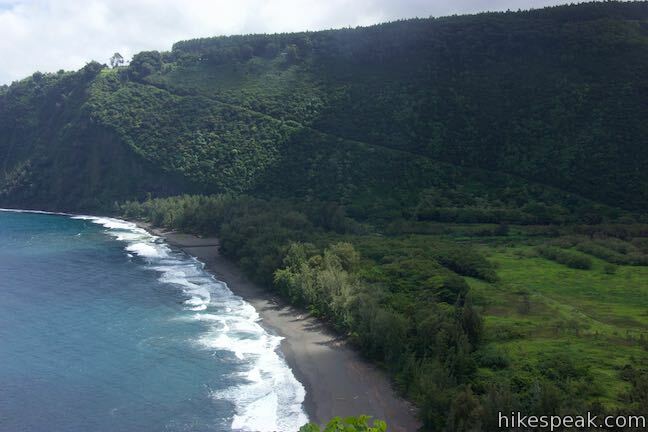 From Waipi‘o beach, it is a short walk inland along the west side of Waipi‘o Valley to the junction with Muliwai Trail. 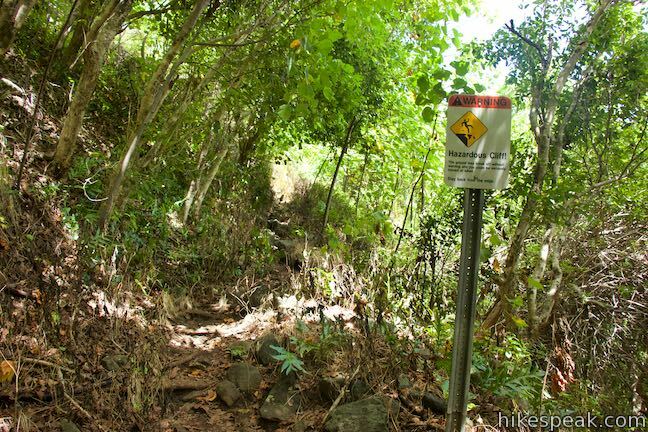 As of 2018, the signs for the trail read Waimanu Trail, which makes sense because the trail leads to Waimanu Valley, but the trail is officially known as Muliwai Trail. 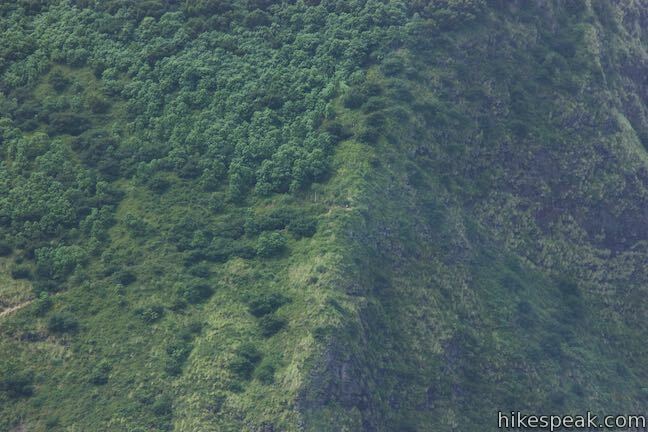 To complicate the naming game, the stretch of the trail up the wall of Waipi‘o Valley is also called the Z-Trail because of its dramatic switchbacks, visible from a distance. 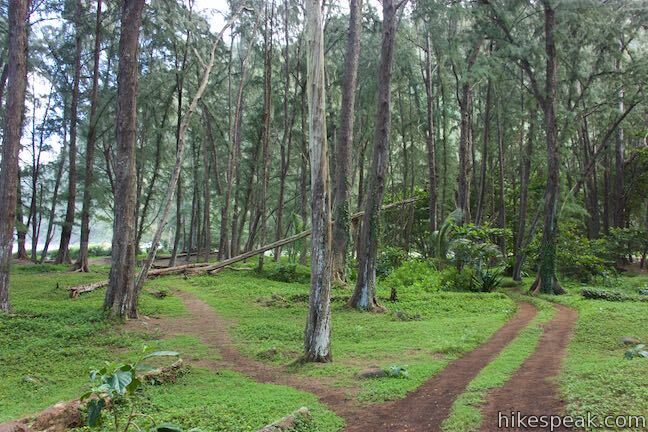 Turn right onto Muliwai Trail and start the climb. 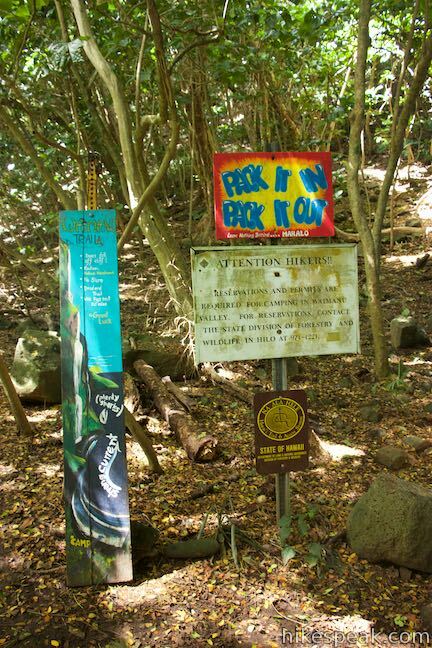 Pass a sign at the boundary of the Muliwai Section of Kohala Forest Reserve. 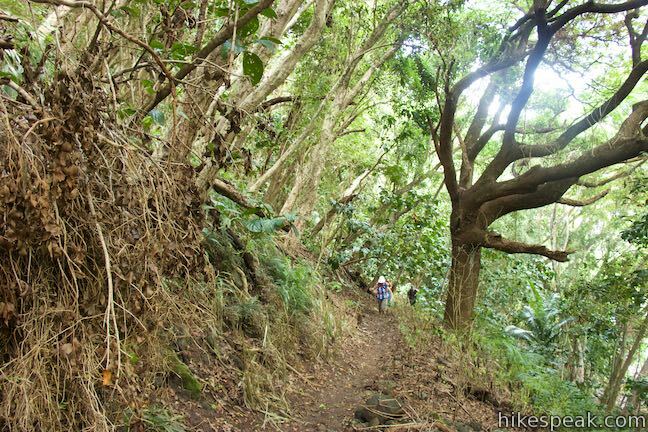 Trees hang over the trail, so much of the ascent is shaded. 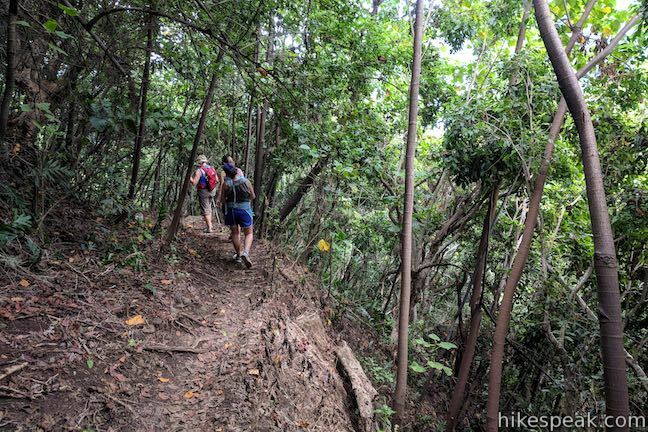 The steepness of the trail is made tougher by the valley’s heat and humidity, so it can feel refreshing to catch breezes once you rise above the trees (the bold views are invigorating too). 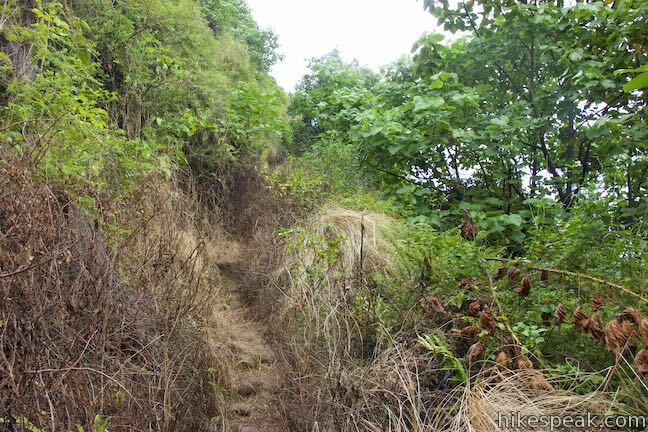 After turns to the left, right, and left (three switchbacks), the trail leaves the forest for shorter brush and grasses that sprout from the sheer valley wall. 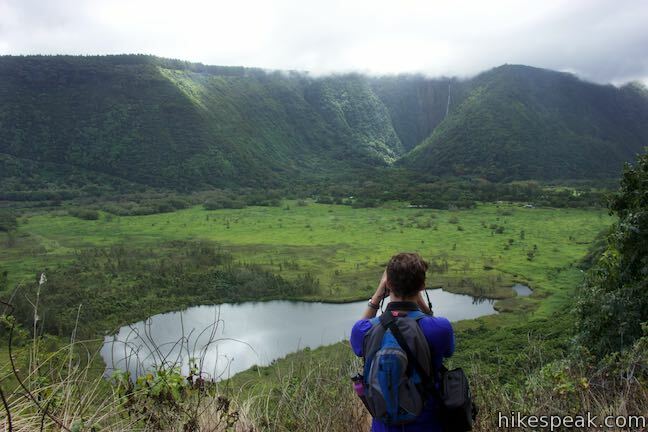 After 0.2 miles on Muliwai Trail, things open up for a grand perspective over Waipi‘o Valley that will stop your in your tracks. 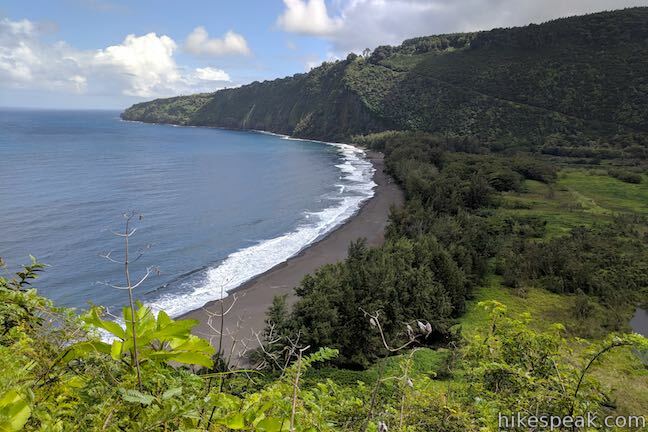 If you liked the views from Waipio Lookout, you’ll love what Muliwai Trail has to offer – basically the opposite perspective across Waipi‘o Valley. 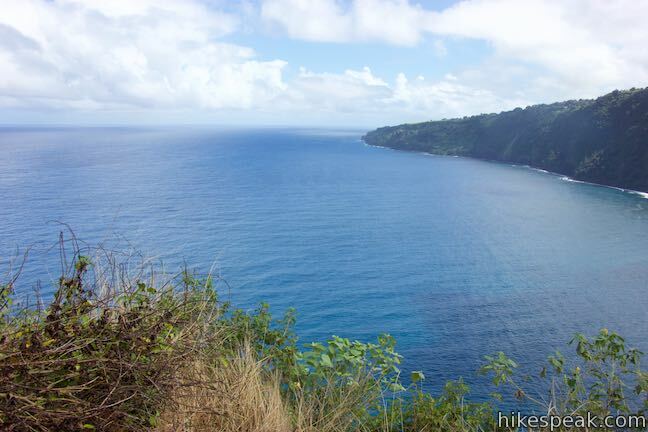 Muliwai Trail boasts a significantly broader vantage up the valley. 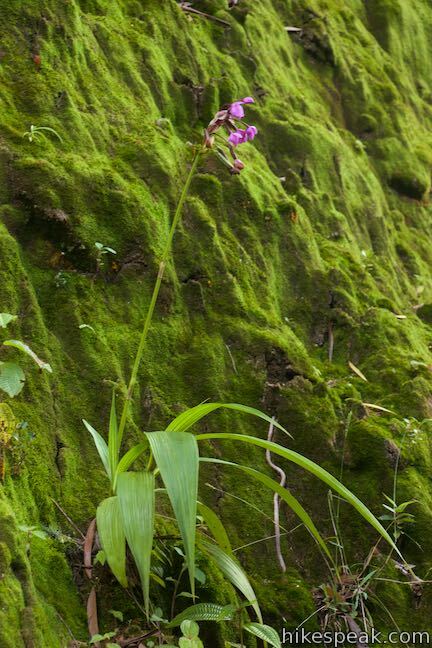 Looks south over wetlands and fields that transition into a tropical rainforest wedged between steep green walls. 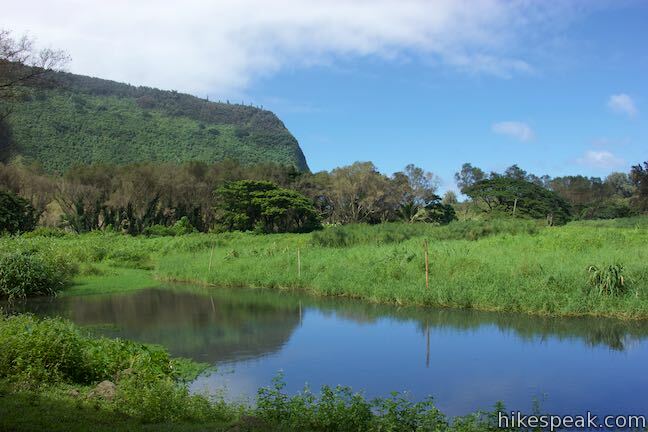 On the west side of the valley below the trail, kidney-shaped Muliwai Pond offers a glistening reflection of the sky. 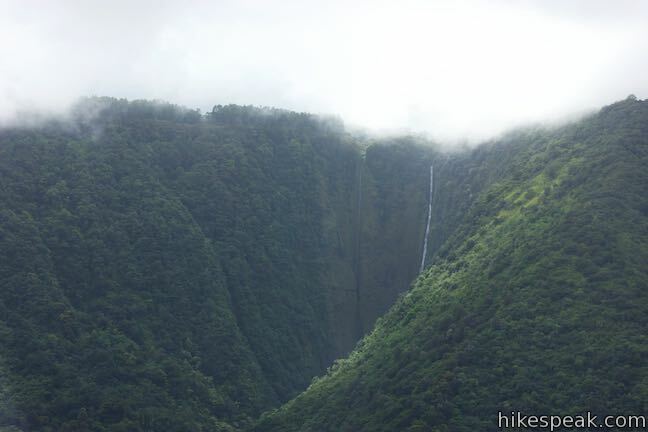 Along the east wall of Waipi‘o Valley, Hi‘ilawe Falls drops approximately 1,450 feet, including a 1,200-foot single fall from the valley wall. 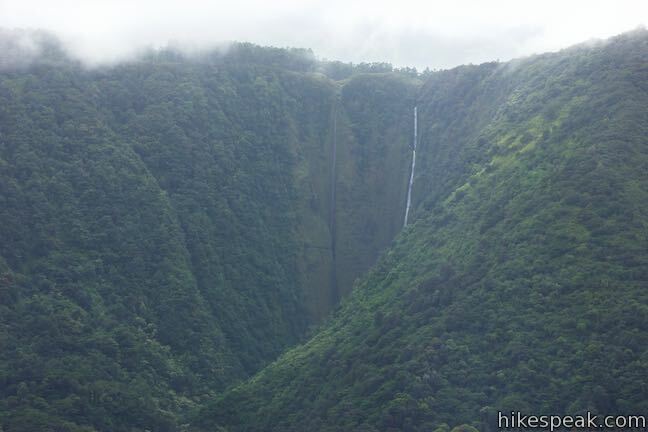 The beautiful waterfall is on private land and not accessible by trail, so this distant view is one of the best ways to see Hi’ilawe Falls. 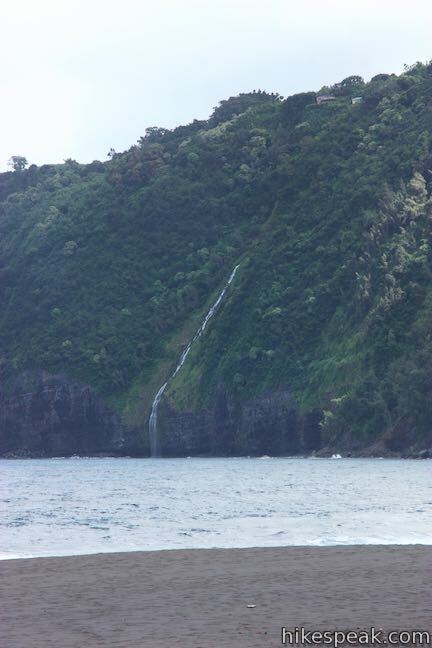 The bottom of Hi‘ilawe Falls is shielded from view by a slope on the valley wall. The vistas expand over the next eighth of a mile. The trail is steep, rocky, and narrow. Any time you need to catch your breath, just pause and enjoy the sweeping surroundings. 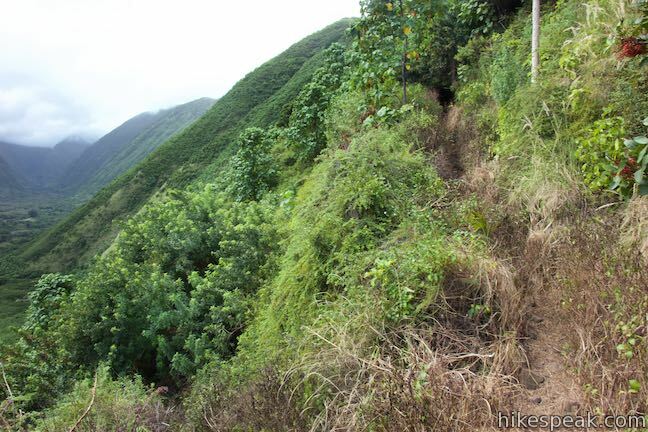 The drop-offs on the right side of the trail are precipitous, so watch your step. 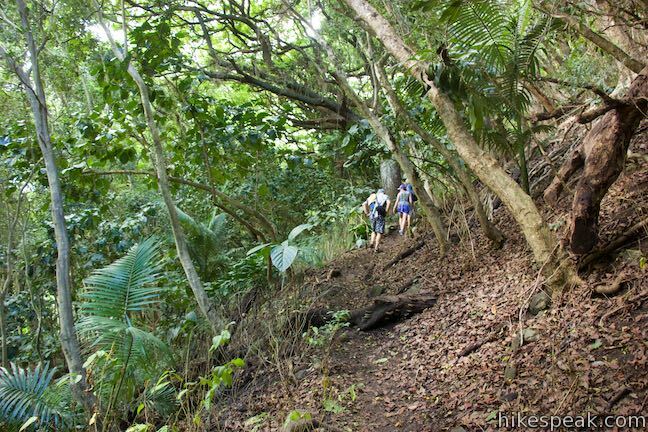 After a third of a mile of climbing, Muliwai Trail comes to another sharp switchback (living up to it’s Z-Trail nickname). Off the right side of the trail, find an obvious, but unmarked, vista point. Step out and take in some spectacular sights. 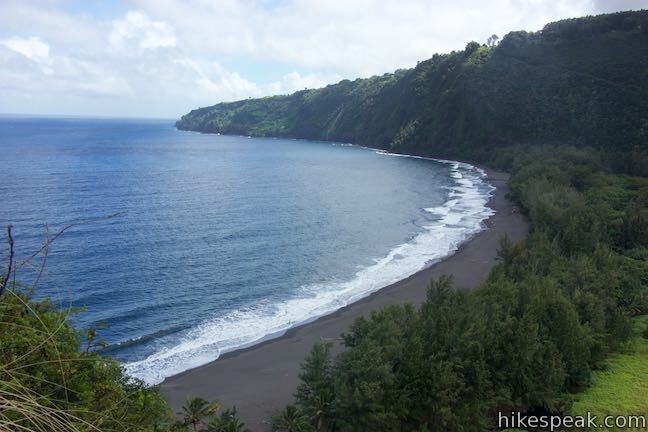 Waipi‘o Beach is below, stretching east and curving gently to the left. 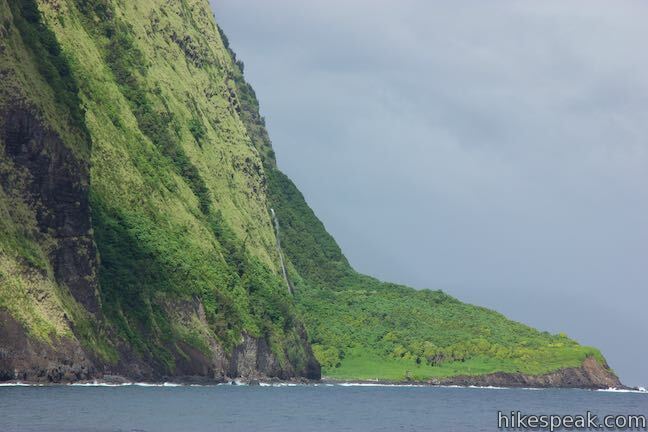 Look farther up the coastline to see Lakuahine Falls cascading down the cliffs toward the ocean. 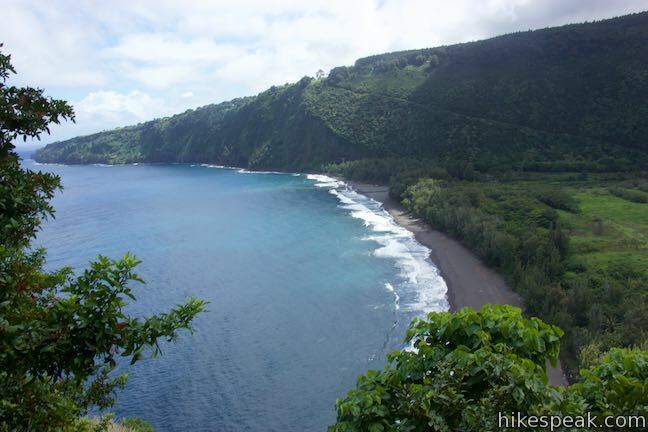 Waipi‘o Bay is laid out below you, cradling gorgeous blue water. 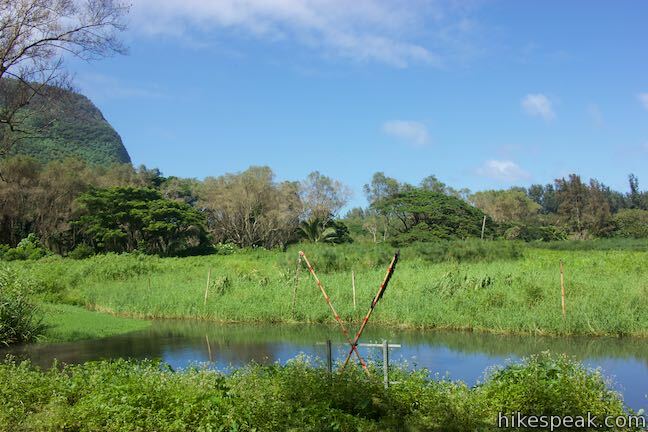 To the right, look over ponds and streams surrounded by the greenery of Waipi‘o Valley. 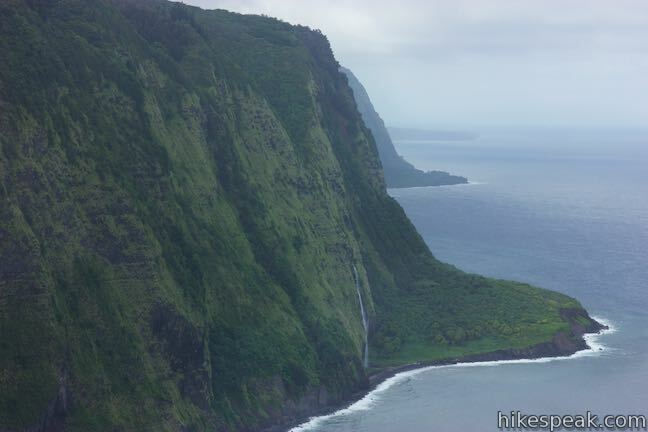 Hi’ilawe Falls is in view as well (which is why this spot can also be called Hi‘ilawe Falls Overlook instead of Muliwai Trail Overlook). This lookout offers a lot to look at! Are you the type of person who visits a spectacular tropical valley and wonders what the next valley over looks like? 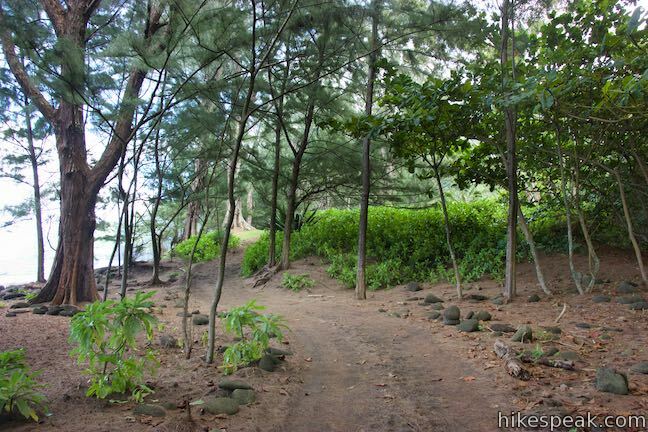 The rest of Muliwai Trail may be for you! 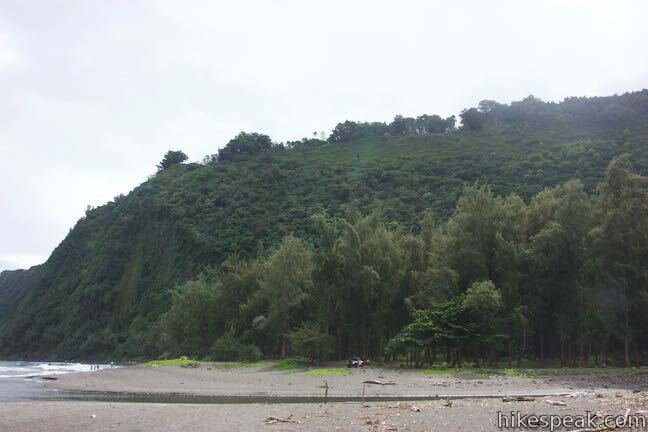 After more switchbacks on the side of Waipi‘o Valley, the trail crosses a series of ridges and gulches before dropping into Waimanu Valley, which looks a lot like Waipi‘o Valley but is even less developed and has a beach-adjacent campground for backpackers. 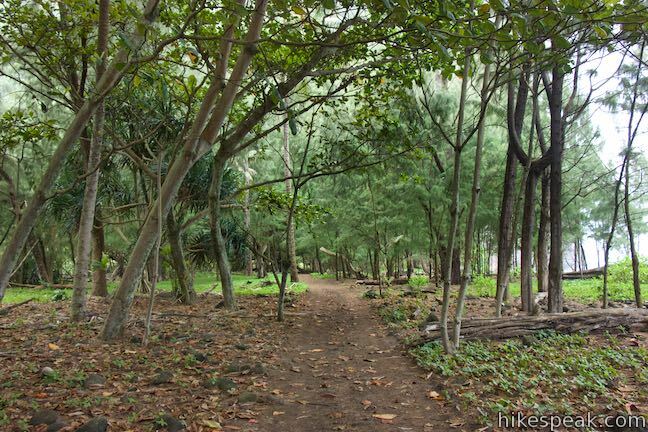 Muliwai Trail is 7.7 miles long and super tough. Unless you’re making this hike into an overnight (permit required), the early lookout is a good place to turn around. 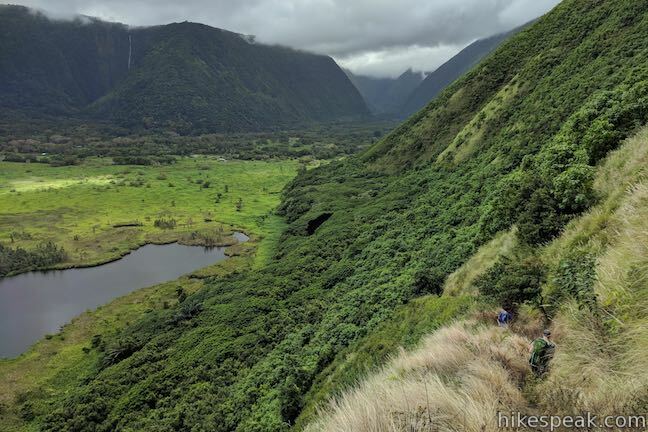 You might chose to climb another 800 feet up the next Z in Muliwai Trail to reach the rim of Waipi‘o Valley and even bigger views. 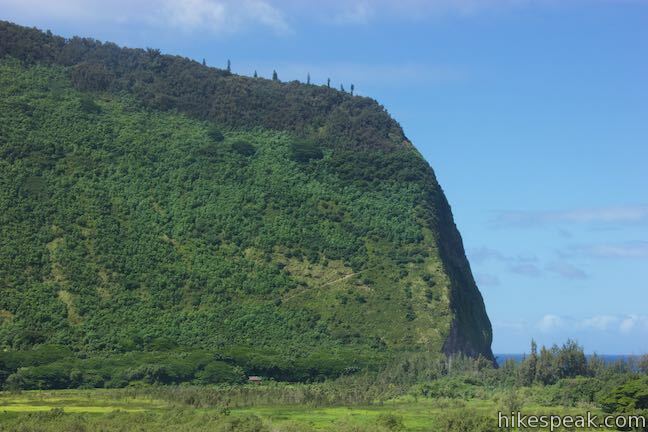 However, be sure to dose your efforts, because after coming down Muliwai Trail and crossing Waipi‘o Beach, a final workout awaits in the 850-foot ascent on Waipio Valley Road. 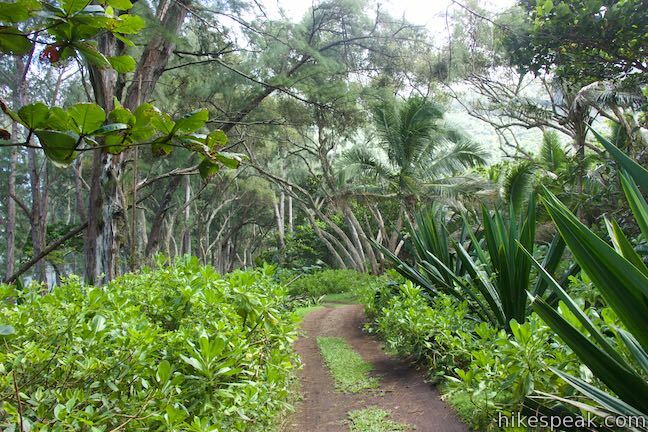 After enjoying all the views, turn around and head down Muliwai Trail. 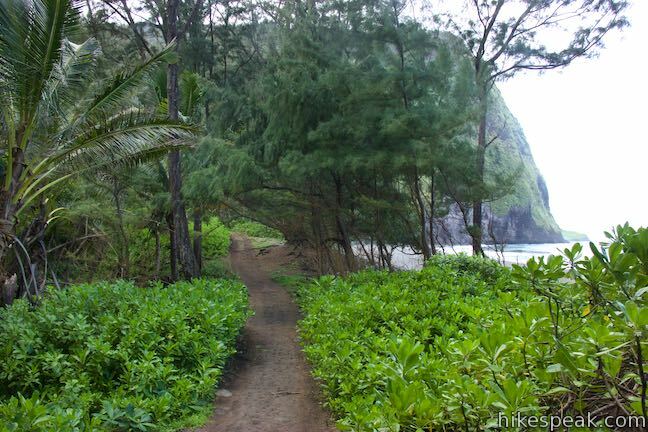 Cross the valley by either walking back across Waipi‘o Beach or taking the trail through the trees behind the beach. 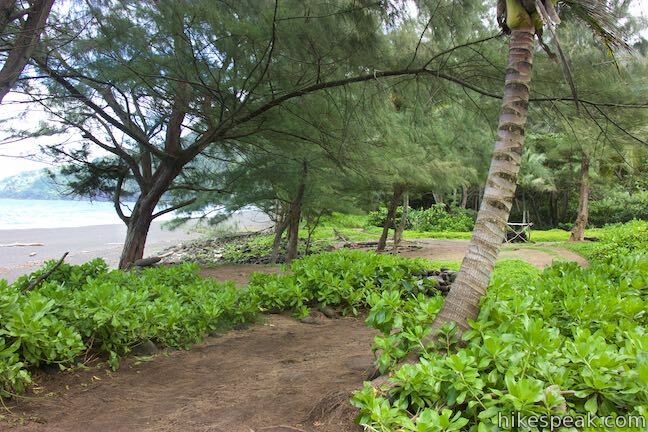 Wade through Wailoa Stream and cool off your lower half in the rushing water. 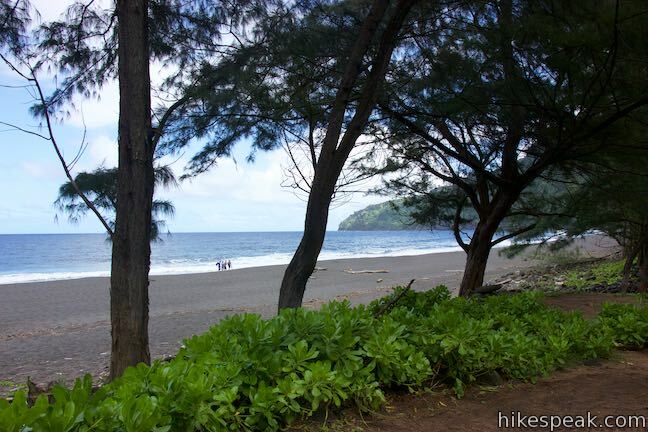 You’ll probably want to linger on Waipi‘o Beach for a while before leaving. 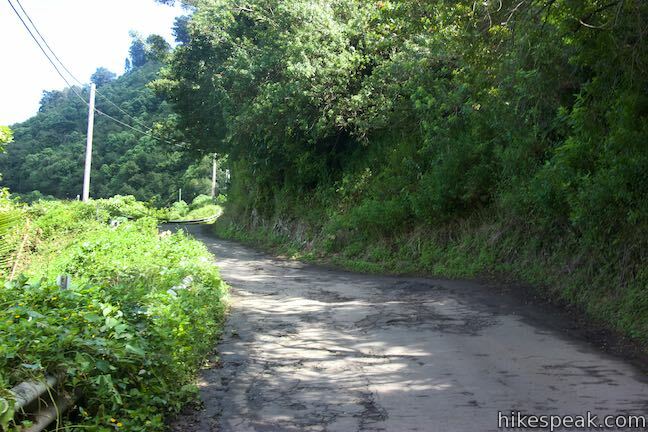 Trek back up the dirt road along the east side of the valley for half a mile to the intersection below the climb. 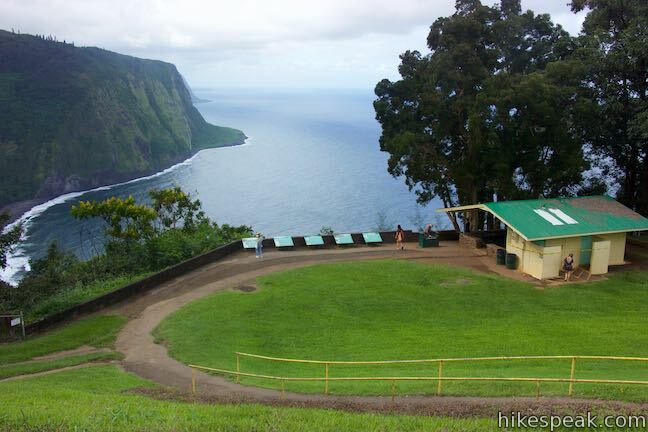 Turn left and ascend 850 feet in the final, grueling 0.83 miles up to Honokaa-Waipio Road beside Waipio Lookout. 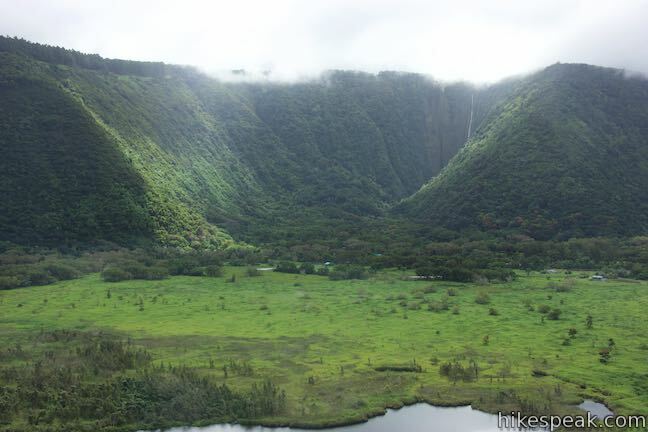 Waipi‘o Valley is beautiful and historic. Be respectful of the valley as you hike. Garbage collection is not provided, so pack out anything that you carry in. Pets are not allowed at Waipio Lookout, but dogs do seem to be allowed at Waipi‘o Beach. Bikes can be used on the roadways (but would you want to). 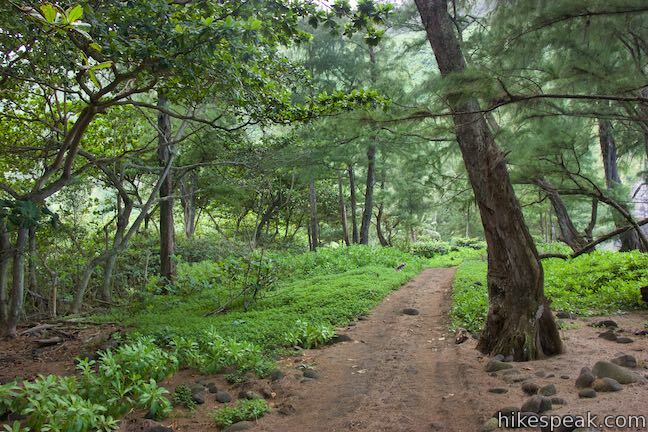 No permit is needed to enter Waipi‘o Valley and day hike on Muliwai Trail. 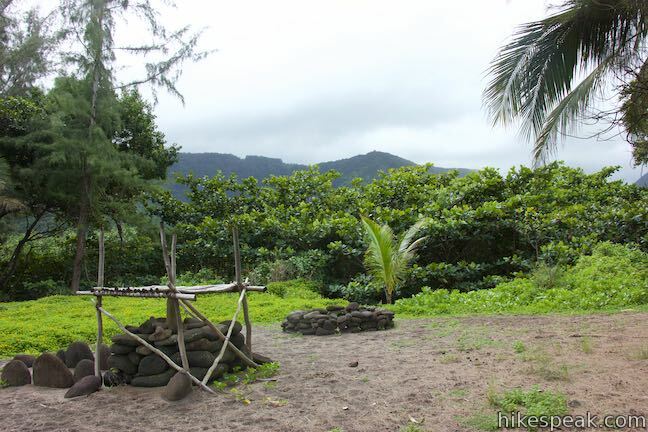 Permits are required for overnight stays at the campground in Waimanu Valley. 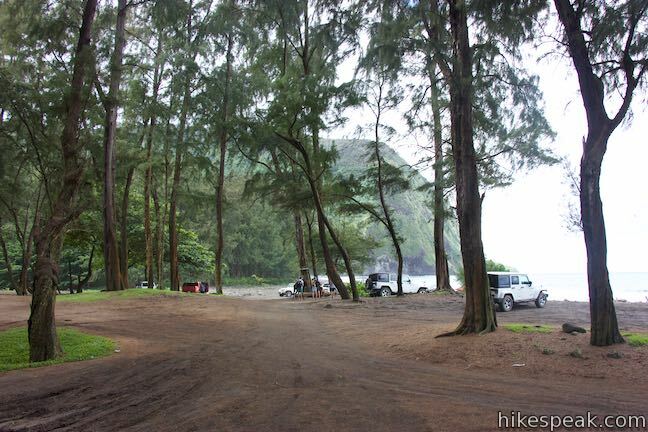 Camping is not allowed at Waipi‘o Beach. Parking at the trailhead is free but limited (observe all street signs). 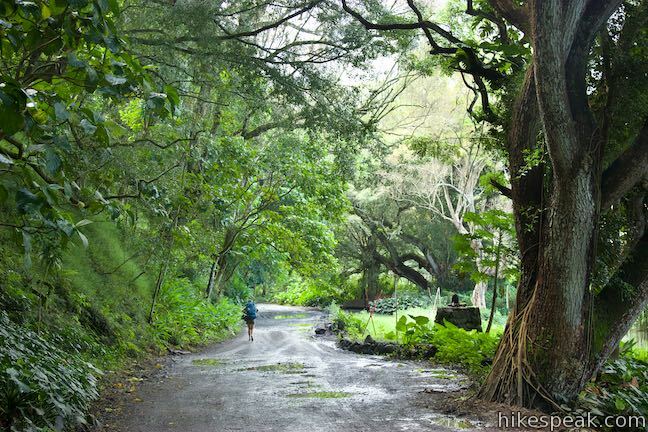 To get to the trailhead: From Waimea, take Hawaii 19 east for 13.5 miles. 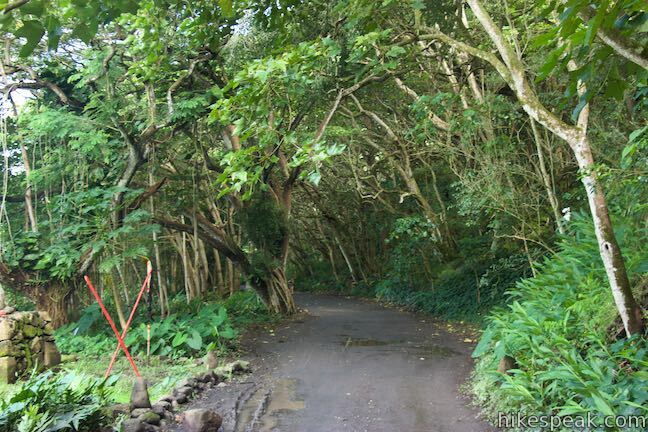 Turn left on Plumeria Street and drive 0.6 miles down to the town of Honakaa. 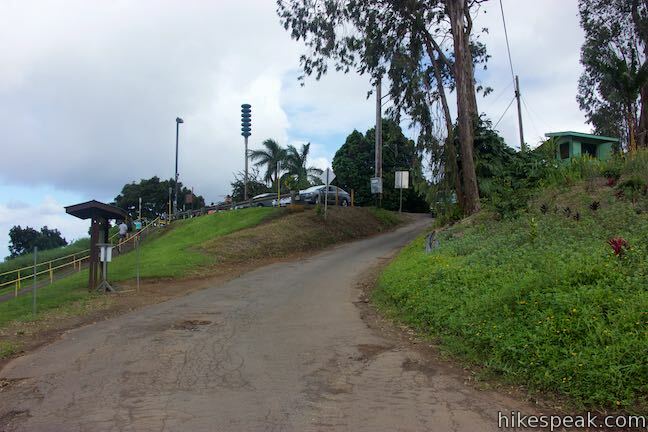 Turn left onto Mamane Street, which becomes Honokaa-Waipio Road (Hawaii 240). 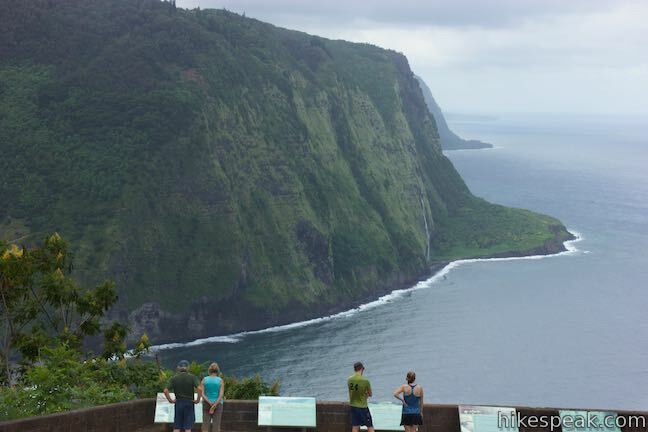 Drive 8 miles to Waipio Lookout at the end of the road. 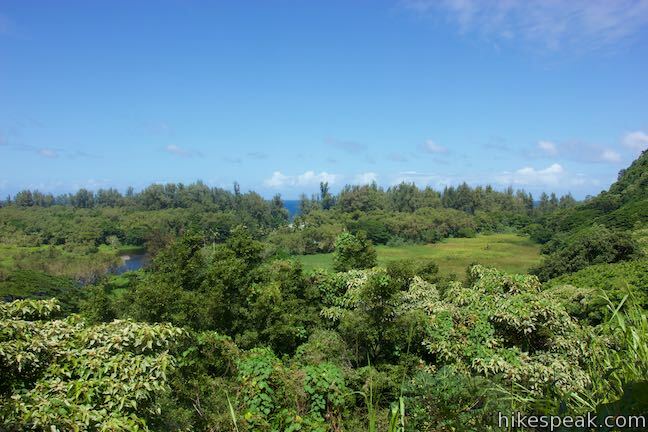 From Hilo, take Hawaii 19 northwest for 39.5 miles. 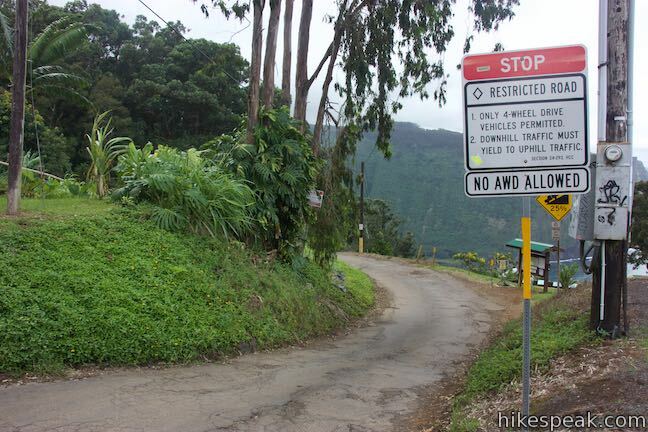 Turn right onto Honokaa-Waipio Road (Hawaii 240), following signs for Honokaa and Waipio. 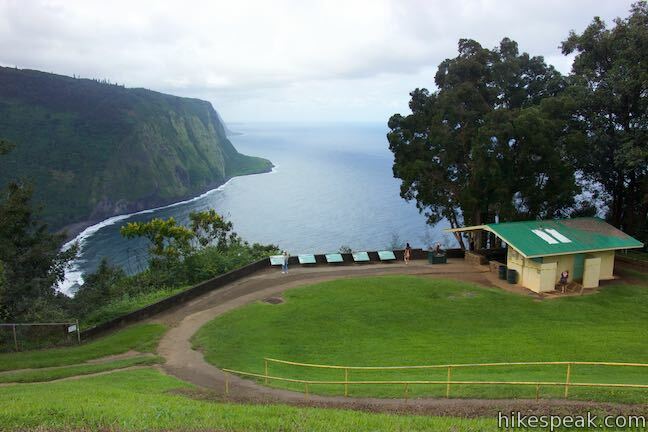 Drive another 9.5 miles to Waipio Lookout. 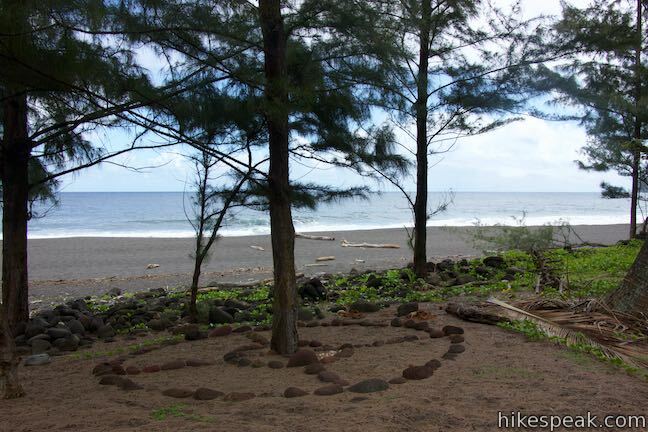 This 0.2 to 1.2-mile hike visits rare rock carvings in Puakō Petroglyph Archeological District on the west coast of the Big Island of Hawai‘i.